Built 2008, 75,579 Grt, United Arab Emirates flag. 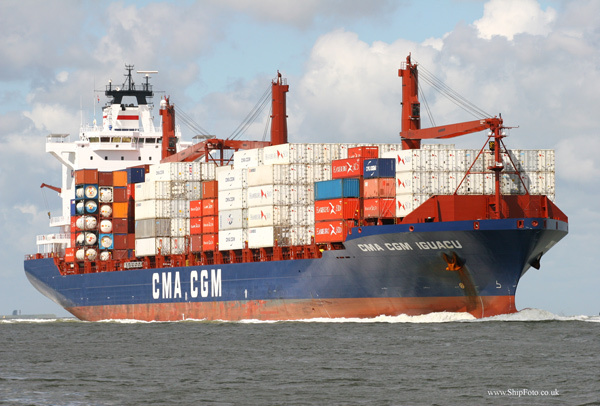 In the River Schelde on 25th June 2009, bound for Antwerp, from Hamburg. Built 2004, 9981 Grt, British flag. 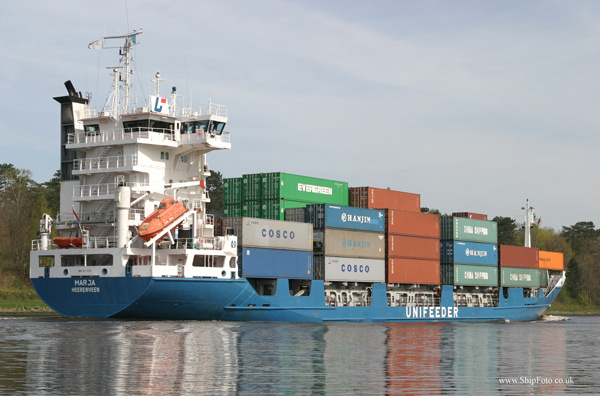 Underway in the Kiel Canal at Rendsburg, Westbound, on 16th April 2007, whilst on a voyage from Copenhagen to Hamburg. Built 1985, 12,554 Grt, Bulgarian Flag. 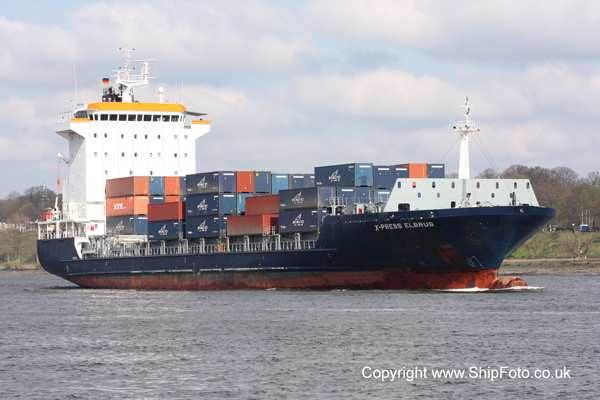 In the River Elbe, on 21st April 2008, bound for Hamburg. Built 1995, 3998 Grt, German flag. 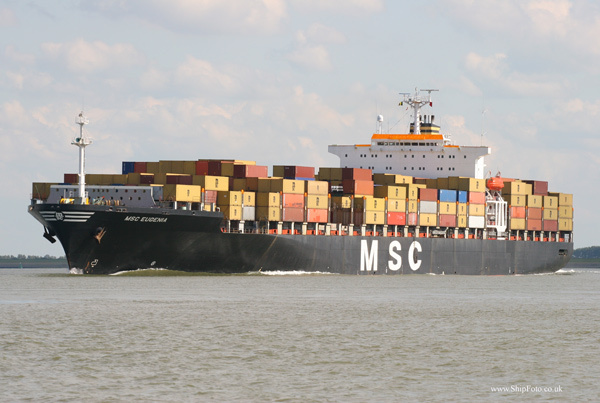 Outward bound in the River Elbe, entering the North Sea after departing from Hamburg on 1st August 2003. Built 2007, 71,867 Grt, Liberian Flag. 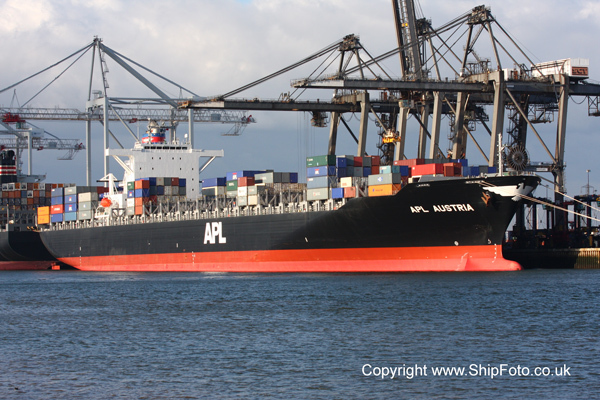 Photographed on 24th November 2008, at Southampton Container Terminal, having arrived from Colombo. Built 2003, 65792 Grt, Liberian flag. 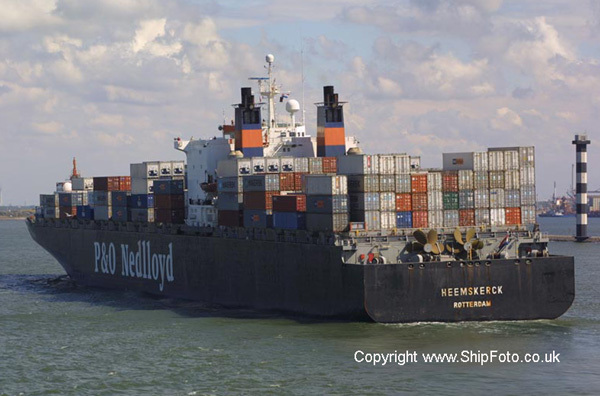 Top photo : Inward bound in the River Schelde, passing Terneuzen, bound for Antwerp on 3rd September 2003. 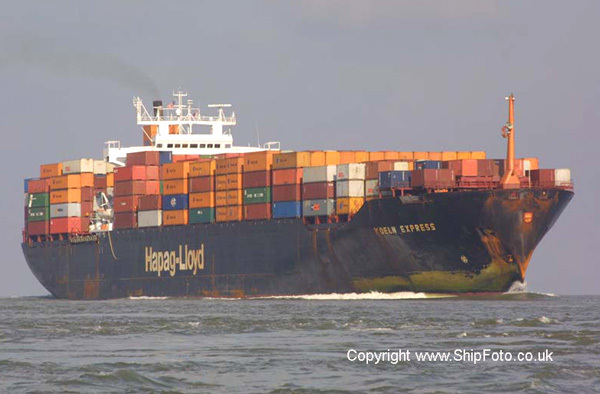 Bottom Photo : Inward bound in the River Schelde, passing Terneuzen, bound for Antwerp on 17th August 2005. Built 2002, 66573 Grt, Liberian flag. 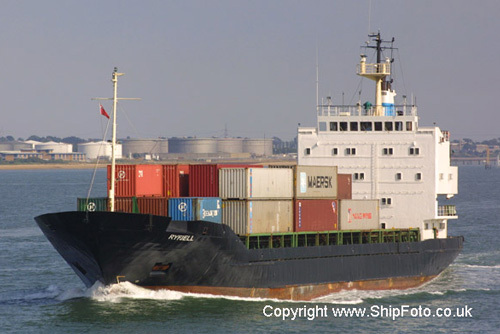 Inward bound in Southampton Water, passing Fawley, for berth 206, Western Docks, Southampton on 5th January 2003. Built 1980, 35065 Grt, Liberia flag. 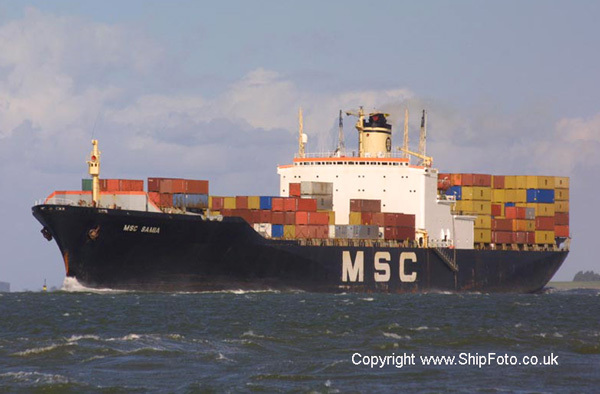 Photographed from Terneuzen whilst inward bound in the River Schelde on 2nd August 2001, bound for Antwerp. Built 1985, 58438 Grt, Bahamas flag. Built 2003, 7519 Grt, British flag. 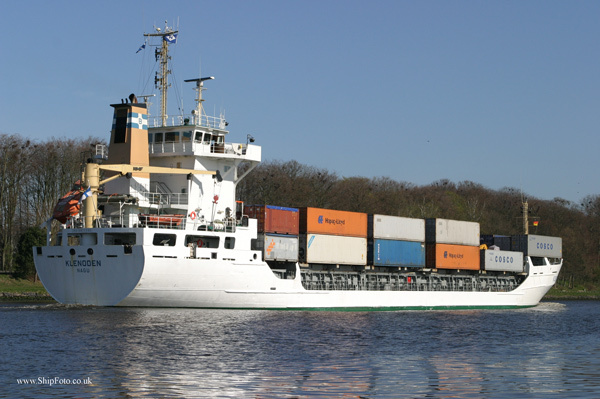 Underway in the Kiel Canal at Rendsburg, Eastbound, on 16th April 2007, whilst on a voyage from Hamburg to Helsinki. Built 2003, 75590 Grt, Liberian flag. 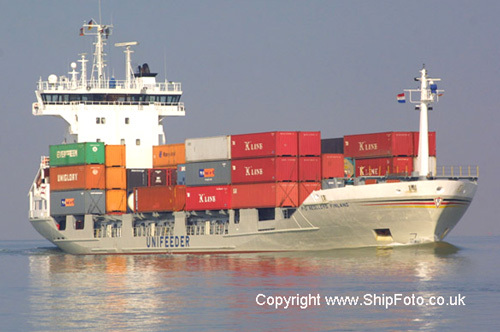 Inward bound in the River Schelde, passing Terneuzen on 19th July 2004, bound for Antwerp from Bremerhaven. Built 2006, 6,701 Grt, Antigua & Barbuda flag. 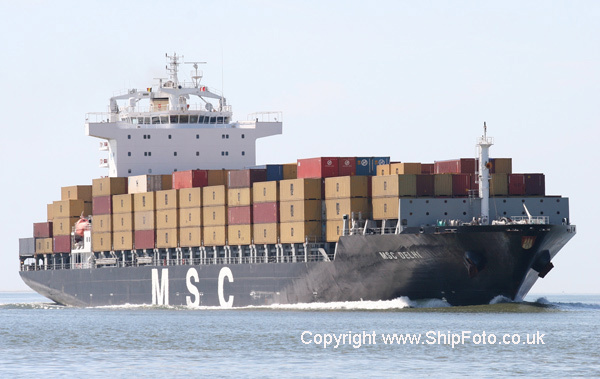 In the New Waterway on 21st June 2009, having departed from Rotterdam for Bremerhaven. Built 1996, 6362 Grt, Antiguan flag. Inward bound in the River Schelde, passing Terneuzen, on 17th August 2007, bound for berth S.909/S.911 Noordzee Terminal, Antwerp. Arriving from Rotterdam. 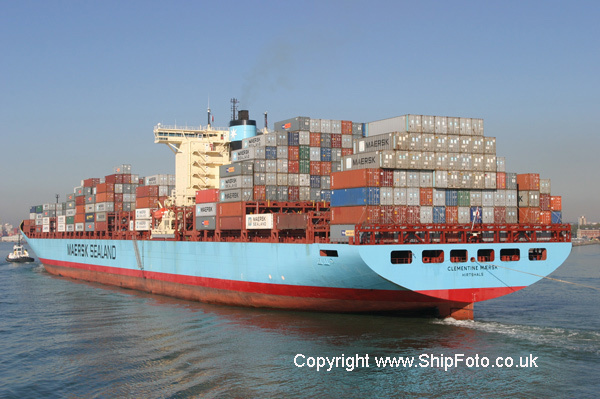 Departed on 18th August for Le Havre. Built 2000, 6365 Grt, Antigua & Barbuda flag. 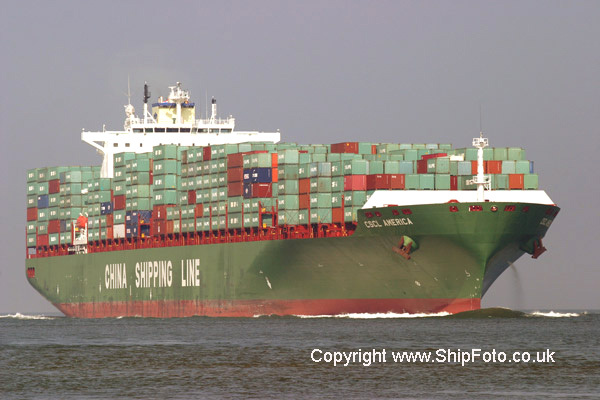 Photographed on 28th July 2001 passing the Hook of Holland whilst outward bound after departing from Rotterdam. Built 1976, 5176 Grt, Malta flag. 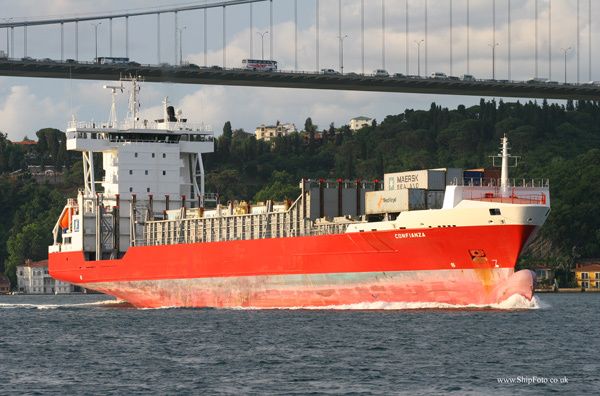 Transitting the Bosphorus on 24th September 2004. Photo taken during the TSS Turkish Tour. Built 1998, 9380 Grt, Malaysian flag. 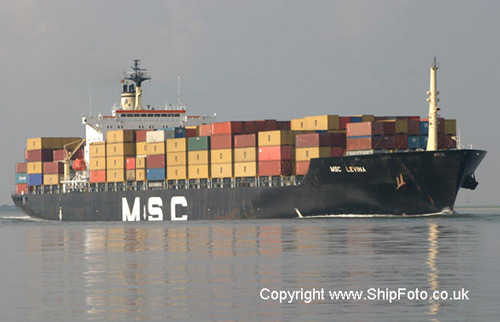 In Southampton Water, inward bound for Southampton Container Terminal on 11th May 2002. Built 2006, 28,927 Grt, Hong Kong flag. 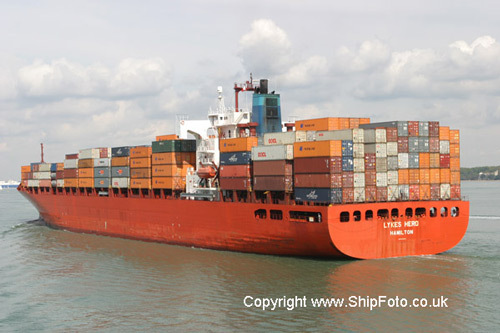 In the New Waterway, bound for Rotterdam on 31st May 2009, having arrived from Tilbury. Built 1995, 33735 Grt, Bermuda flag. 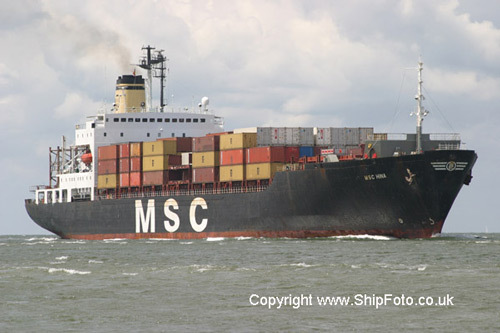 Passing Vlissingen on 21st June 2002, after departing from berth S.855, Antwerp, bound for Hamburg. Photographed during TSS Continental tour. Built 2003, 55994 Grt, British Flag. 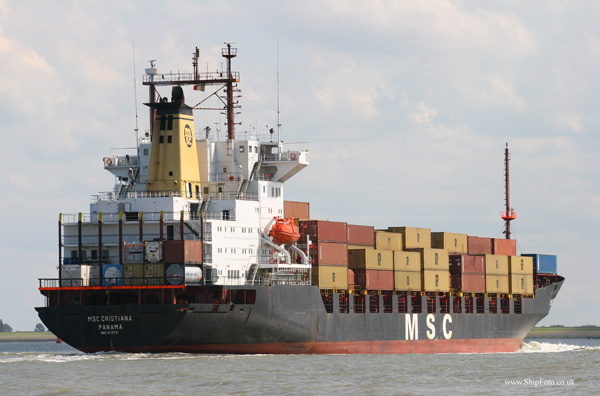 Inward bound in the River Schelde, passing Terneuzen on 17th August 2004, bound for Antwerp. Built 2006, 28,372 Grt, Antigua & Barbudan Flag. 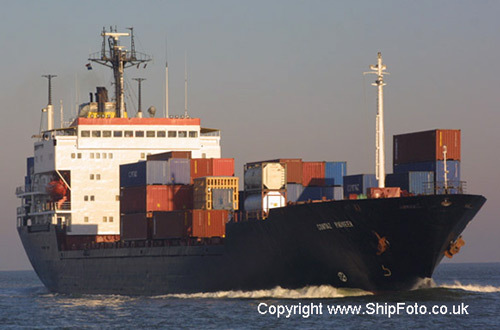 In the New Waterway, on 29th March 2008, bound for Rotterdam, having arrived from Caucedo. Built 2001, 25535 Grt, Antigua flag. 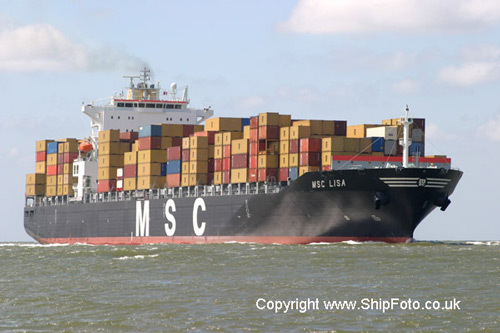 Arriving in Eemshaven, Rotterdam on 17th June 2002. Photographed during TSS Continental tour. Built 2000, 25535 Grt, Liberian flag. 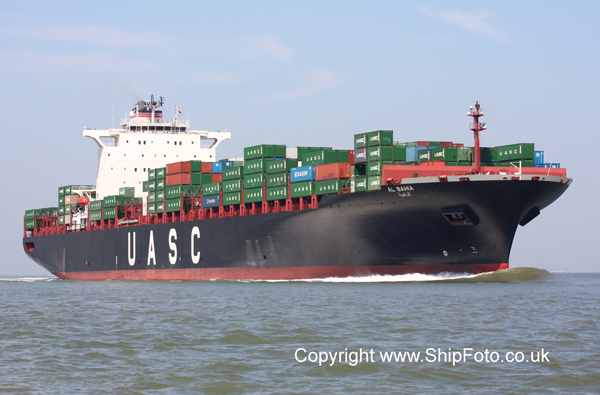 In the River Schelde on 23rd June 2009, bound for Antwerp, having arrived from Bremerhaven. Built 1991, 29841 Grt, German flag. 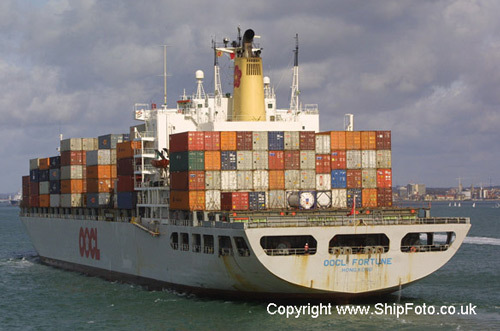 Passing the Hook of Holland after departing from Rotterdam on 10th August 2002. Built 2004, 25709 Grt, Liberian flag. Inward bound on 15th July 2006, in the River Schelde, passing Terneuzen, bound for berth 738/740, Delwaidedok, Antwerp, arriving from Hamburg. 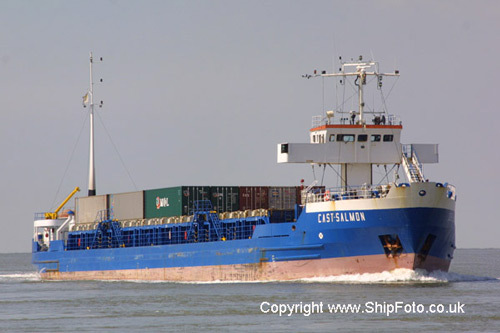 Subsequently departed for Cartagena on 17th July 2006. Built 1990, 35303 Grt, Liberian Flag. Inward bound in the River Schelde, passing Walsoorden, on 22nd July 2004, bound for Antwerp. 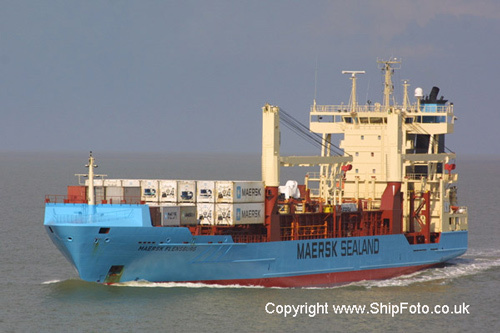 Departed from Antwerp on 24th July 2004 for Le Havre. Built 1995, 23691 Grt, Liberian flag. Inward bound on 17th July 2006, in the River Schelde, passing Terneuzen, bound for berth 736, Delwaidedok, Antwerp, arriving from Bremerhaven. Subsequently departed for Philadelphia on 18th July 2006. Built 1983, 32152 Grt, Bermuda flag. Inward bound on 1st June 2002, in the River Schelde, passing Terneuzen, bound for berth S.855 Antwerp, arriving from Liverpool. Subsequently departed for Montreal on 3rd June 2002. Built 1992, 2691 Grt, Cypriot flag. Built 2007, 18,017 Grt, Dutch Flag. 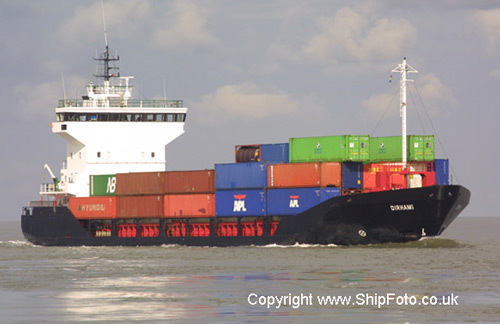 Photographed on 14th July 2008, in the River Schelde, having departed from Antwerp, bound for Hamburg. Built 1985, 6819 Grt, Turkish flag. 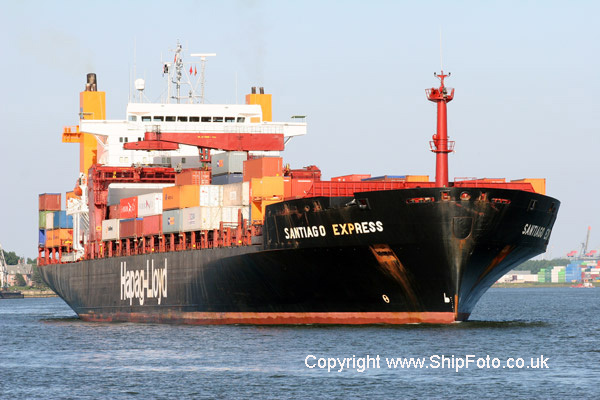 Top : Outward bound in the Bosphorus on 24th Sept 2002, after departing from Armaport, bound for Gioia Tauro. 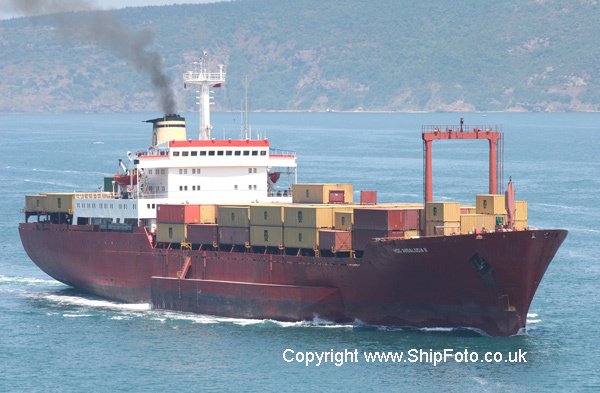 Bottom : In the Bosphorus, passing Kandili, Northbound, on 30th June 2006, after departing from Ambarli for Odessa. Built 2002, 91921 Grt, Danish International flag. Inward bound in Southampton Harbour, off dockhead, bound for berth 207, Western Docks, on 4th November 2006 having arrived from Rotterdam. Assisted by tugs Adsteam Lyndhurst and Adsteam Sarah. 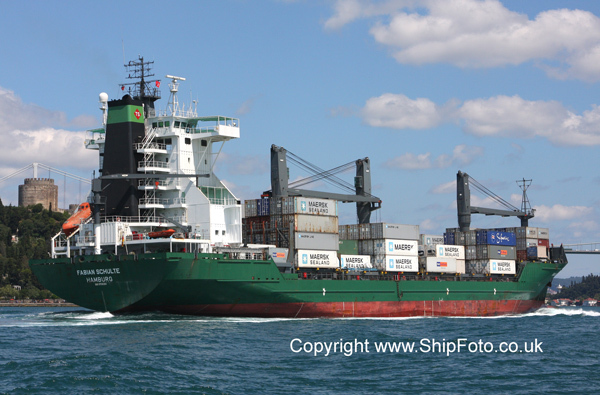 Departed on 5th November for Gioia Tauro. Built 1996, 30280 Grt, Liberian flag. 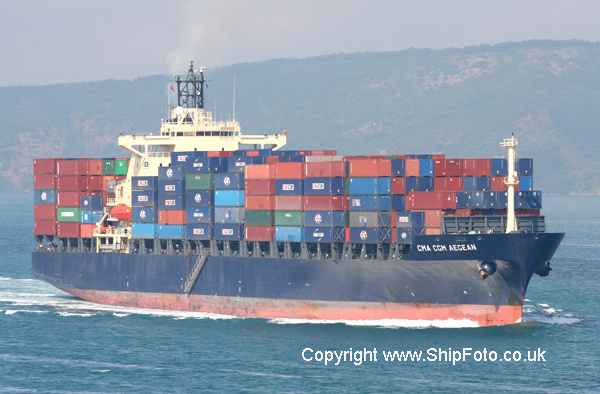 Passing Rumeli Kavagi, Southbound, in the Bosphorus on 26th June 2006. 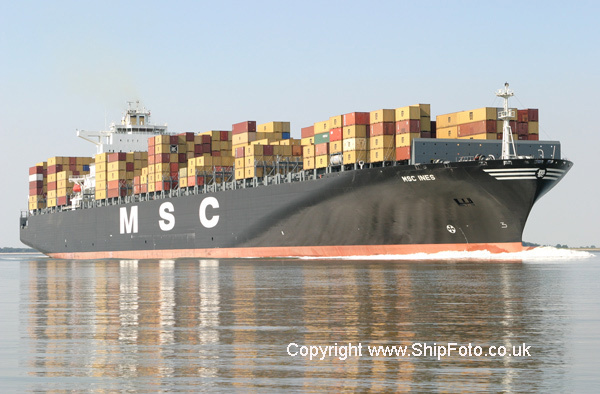 On a voyage from Constantza to Damietta. Built 2006, 42,382 Grt, Cyprus Flag. 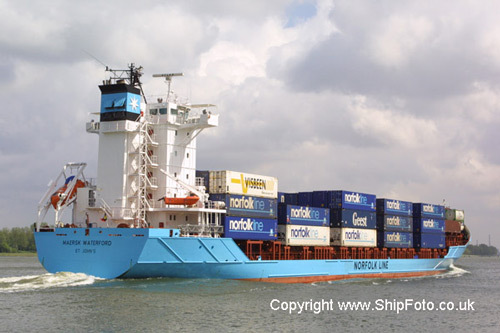 Arriving at Southampton on 24th October 2008, from Marsaxlokk, Malta. Built 2007, 22,801 Grt, Liberian Flag. 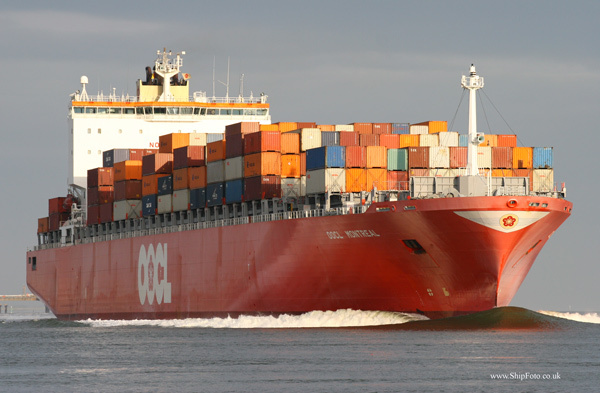 In the River Schelde on 25th June 2009, bound for Antwerp, arriving from Rotterdam. Built 2006, 27059 Grt, Liberian flag. Inward bound in the River Schelde, passing Terneuzen, on 16th August 2007, bound for Antwerp. Arriving from Hamburg. 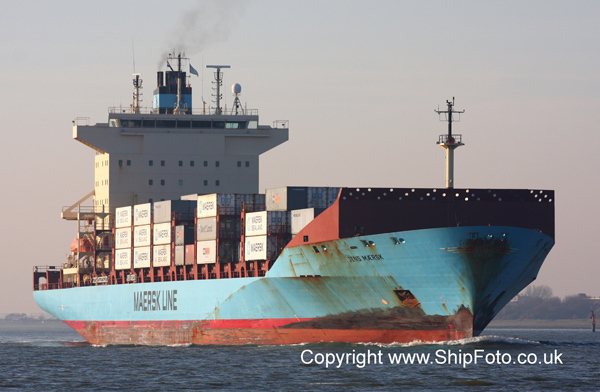 Departed on 16th August for Le Havre. Built 2008, 40,560 Grt, Greek flag. 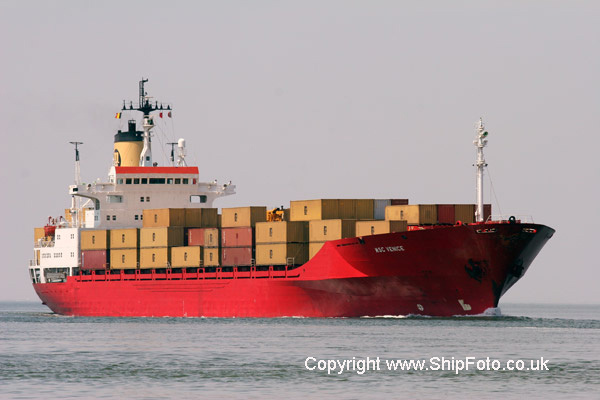 Inward bound in the River Schelde, passing Walsoorden, on 26th June 2009, having arrived from Rotterdam. Built 1991, 36627 Grt, Liberian flag. Inward bound in the River Schelde, on 17th August 2007passing Terneuzen, bound for berth 1706/1708, Antwerp. 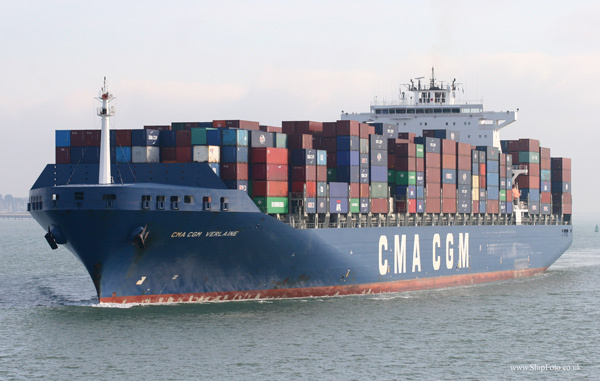 Arriving from Le Havre. 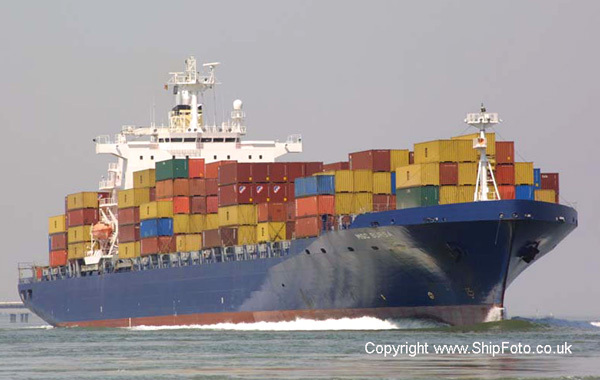 Departed on 18th August for Rotterdam. Built 2001, 72760 Grt, German flag. Inward bound in Southampton Water, on 4th February 2007, bound for berth 206, Southampton, arriving from Marsaxlokk. 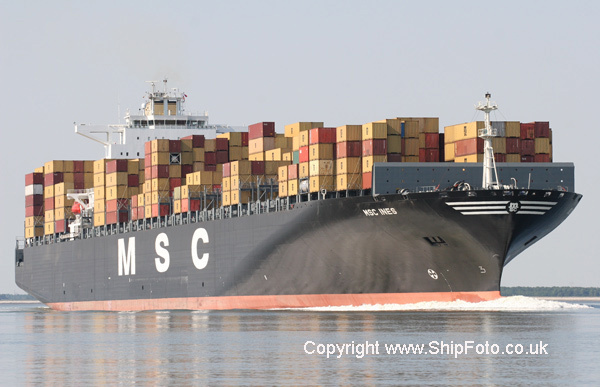 Departed on 5th February for Hamburg. Built 2004, 9962 Grt, Antiguan flag. 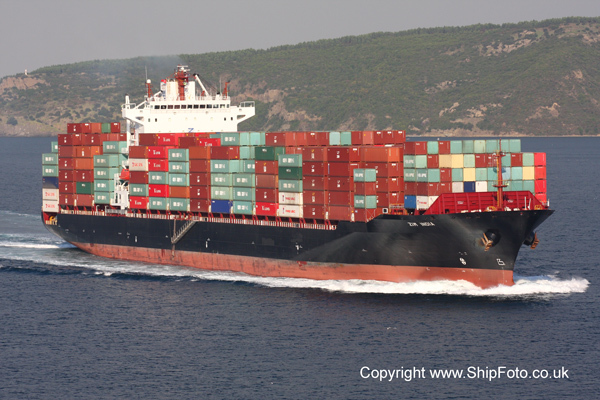 In the Bosphorus, passing Rumeli Hisari, Southbound, on 13th July 2007, whilst on a voyage from Poti to Gioia Tauro. Built 1999, 9,953 Grt, German flag. 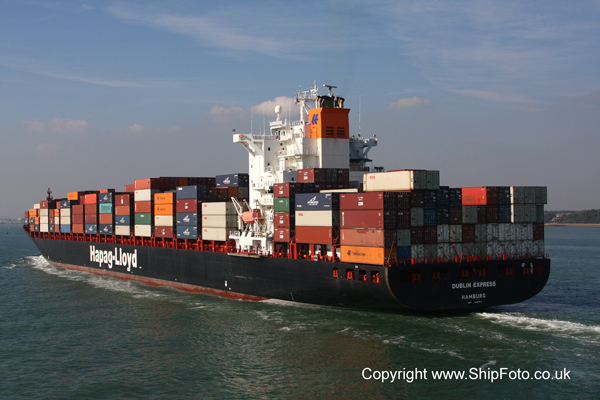 Outward bound in the New Waterway, having departed from Rotterdam on 21st March 2009, bound for St. Petersburg. 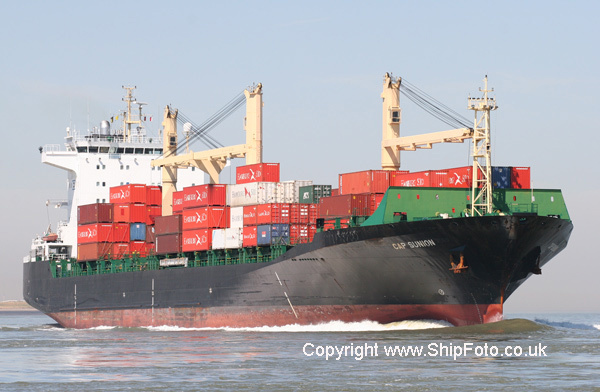 Inward bound in the River Schelde, passing Terneuzen, bound for berth 246, Hansadok, Antwerp. 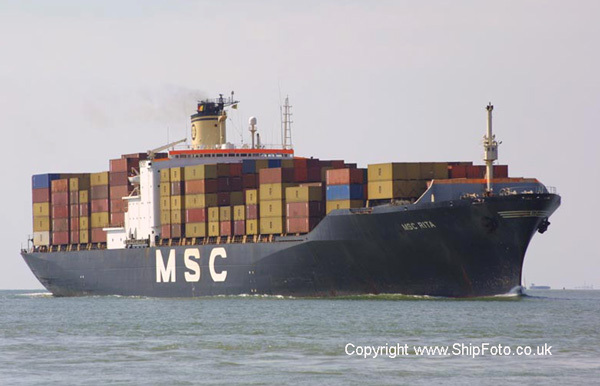 Arriving from Rotterdam on 5th September 2003. 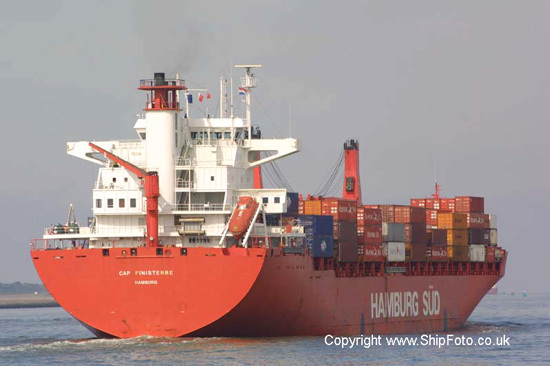 Departed on 6th September 2003 for Salerno. Built 2006, 109149 Grt, Greek flag. Inward bound on 19th July 2006, in the River Schelde, passing Terneuzen, bound for berth 1704/1708, Doeldok, Antwerp, arriving from Hamburg. 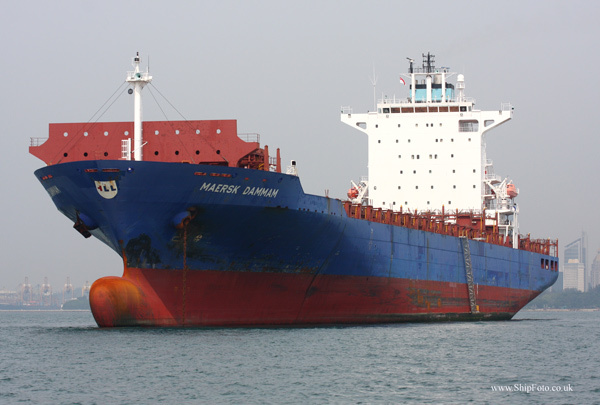 Subsequently departed for Singapore on 20th July 2006. Built 1987, 39132 Grt, American flag. Inward bound in Southampton Water, on 7th October 2006, for berth 205, Western Docks, Southampton, arriving from Antwerp. 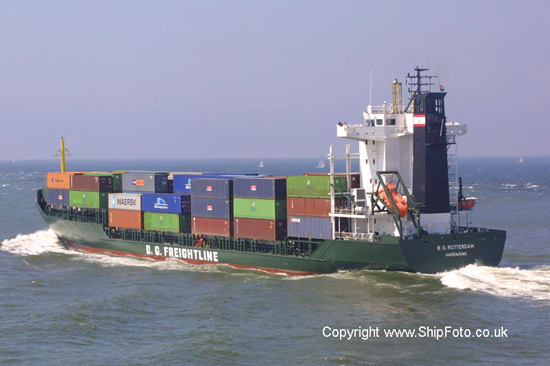 Departed on 8th October for Bremerhaven. Built 1997, 53,324 Grt, German flag. 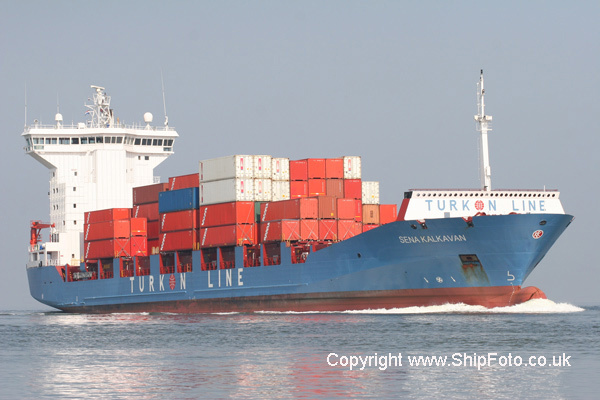 In the Bosphorus on 14th August 2009, passing Northbound, whilst on a voyage from Ambarli, Turkey, to Odessa. Built 1999, 16177 Grt, Marshall Islands flag. 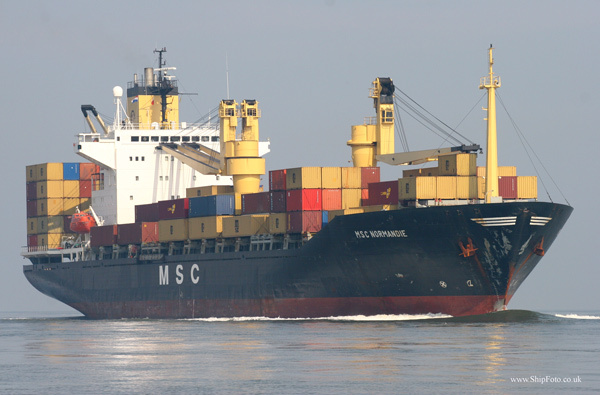 Inward bound in the River Schelde, passing Terneuzen on 20th August 2004, bound for Antwerp from Hamburg. 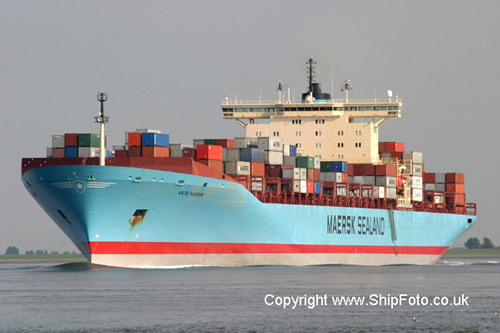 Departed on 21st August 2004 for Le Havre. Built 2005, 25,414 Grt, German flag. 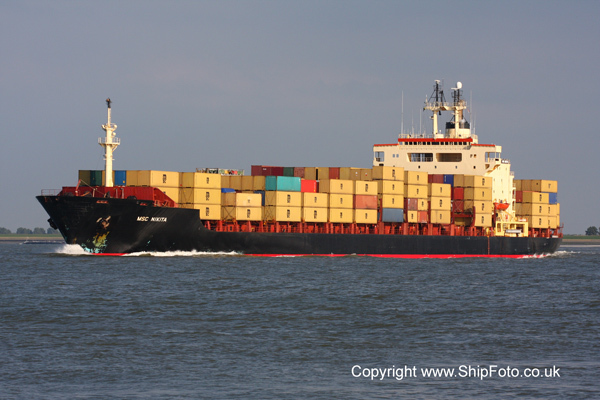 Inward bound in the River Schelde, on 26th June 2009, whilst on a voyage from Hamburg to Antwerp. Built 2004, 90645 Grt, Cypriot flag. Inward bound in the River Schelde, passing Terneuzen, bound for Antwerp on 17th August 2005. Arriving from Rotterdam. Built 2001, 66058 Grt, Liberian flag. Inward bound in the River Schelde, passing Terneuzen, bound for Antwerp on 19th July 2005. Built 1994, 30526 Grt, Cypriot flag. Inward bound in the River Schelde on 3rd September 2003, passing Terneuzen, bound for Antwerp. Built 2000, 5067 Grt, Dutch flag. 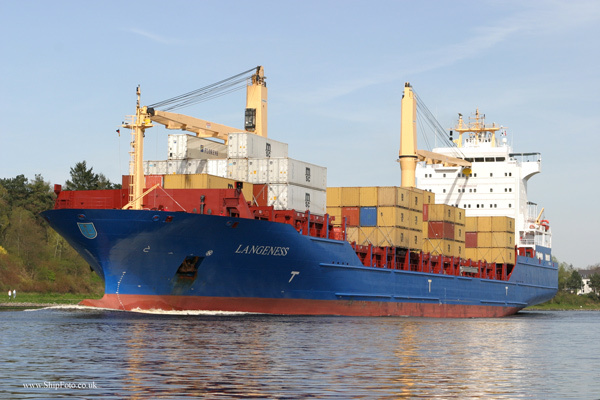 Underway in the Kiel Canal at Rendsburg, Eastbound, on 14th April 2007, whilst on a voyage from Hamburg to Riga. Built 1998, 48154 Grt, United Arab Emirates flag. Inward bound on 17th July 2006, in the River Schelde, passing Terneuzen, bound for berth S.865, Europa Terminal, Antwerp, arriving from Hamburg. 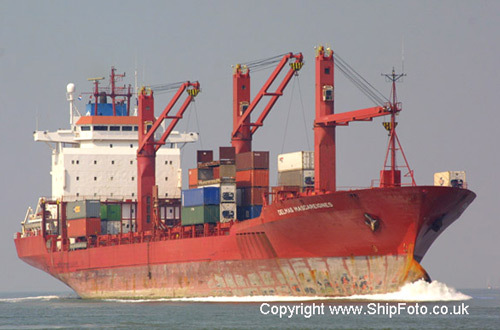 Subsequently departed for Gioia Tauro on 18th July 2006. Built 1990, 18000 Grt, Liberian flag. Inward bound in the River Schelde on 4th September 2003, passing Terneuzen, bound for Antwerp. Built 1996, 2658 Grt, Estonian flag. Inward bound in the River Schelde on 1st September 2003, passing Terneuzen, bound for Antwerp. Built 2002, 46,009 Grt, German Flag. 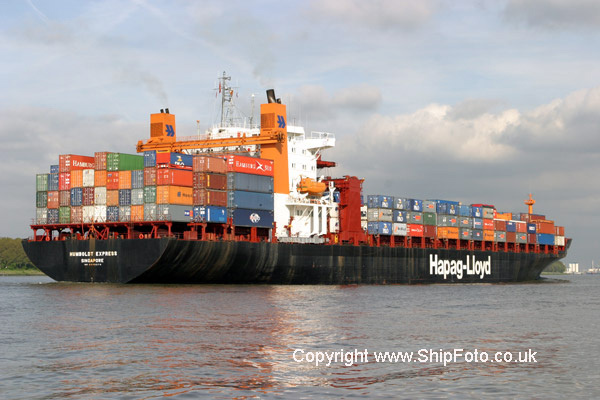 Photographed on 27th September 2008, arriving at Southampton, from Le Havre. Built 2000, 66,289 Grt, German Flag. 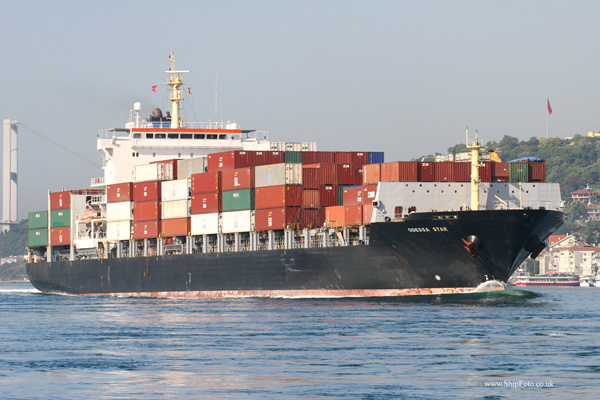 Passing Kandili, Northbound, in the Bosphorus, on 7th October 2008, bound for Illichivsk. Built 2006, 9,910 Grt, Antigua flag. 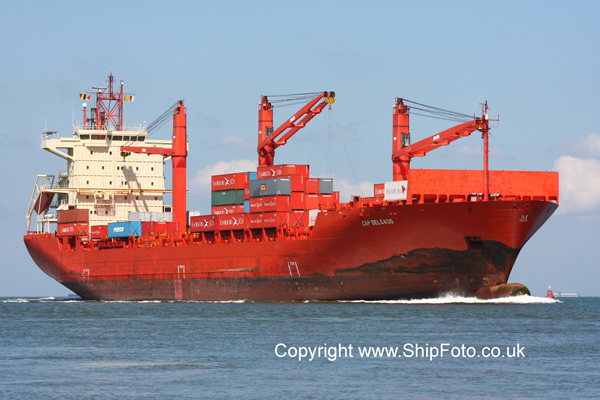 Inward bound in the River Schelde on 23rd June 2009, passing Walsoorden, bound for Antwerp from Leixoes. Built 1998, 40306 Grt, Antigua flag. Built 1994, 46734 Grt, Panama flag. Arriving at Singapore on 2nd November 2005 from Hong Kong. Departed from Singapore on 3rd November for Haifa. Photographed during TSS Far East Trip. Built 1993, 53815 Grt, German flag. Inward bound in Southampton Water, bound for berth 206, Western Docks, Southampton, on 6th April 2007, arriving from Halifax. 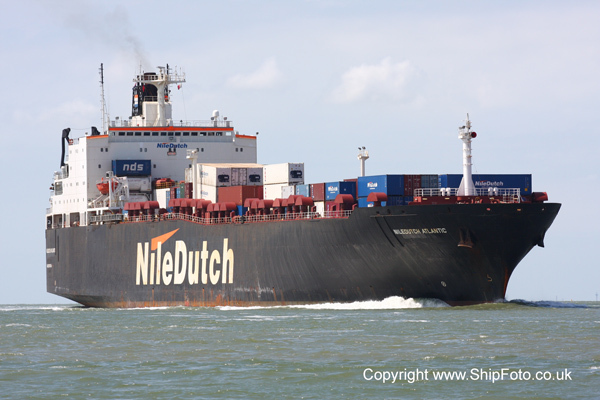 Departed on 7th April for Rotterdam. Built 1997, 15,929 Grt, German flag. 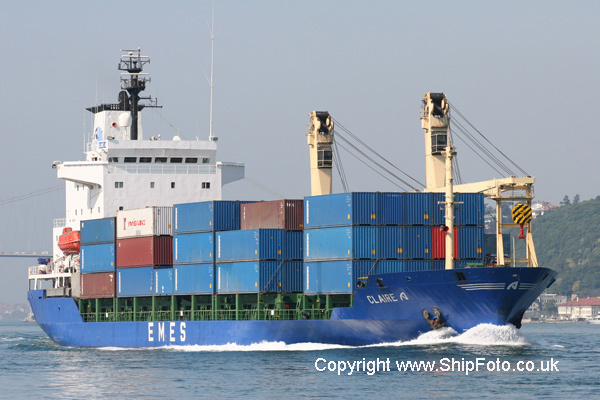 In the Bosphorus on 13th August 2009, whilst on a voyage from Gioia Tauro to Constantza. Built 1998, 41788 Grt, Qatar flag. Inward bound in the River Schelde, passing Terneuzen, on 14th August 2007, bound for Antwerp. Arriving from Thamesport. 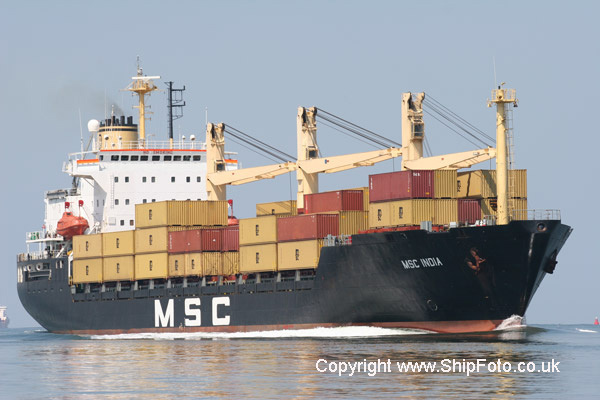 Departed on 16th August for Jeddah. Built 2004, 25,406 Grt, Liberian flag. 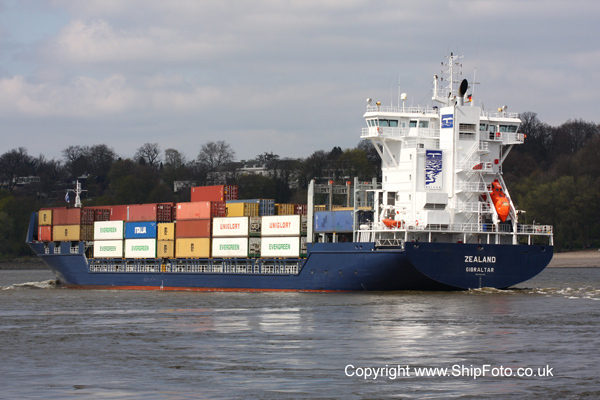 Outward bound in the New Waterway, on 21st March 2009, having departed from Rotterdam, bound for Tilbury. Built 1995, 2899 Grt, Antigua flag. Inward bound in the Nieuwe Waterweg, passing Rozenburg, bound for Rotterdam on 18th June 2002. Photographed during TSS Continental tour. Built 2004, 7850 Grt, Antigua flag. Inward bound in the Nieuwe Waterweg, passing Rozenburg, bound for Beatrixhaven, Rotterdam on 29th April 2005. Built 1978, 51982 Grt, Netherlands flag. 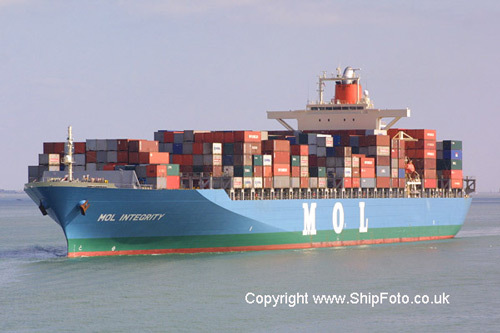 Photographed on 4th August 2001, inward bound at the Hook of Holland for Rotterdam. Built 1984, 32444 Grt, Singapore flag. Inward bound in the Nieuwe Waterweg, passing Rozenburg, bound for Rotterdam on 29th April 2005. Built 1995, 14923 Grt, Liberian flag. Inward bound in the River Schelde, passing Terneuzen, bound for Antwerp on 17th July 2005. Arriving from Richmond. Built 1993, 14849 Grt, Cyprus flag. 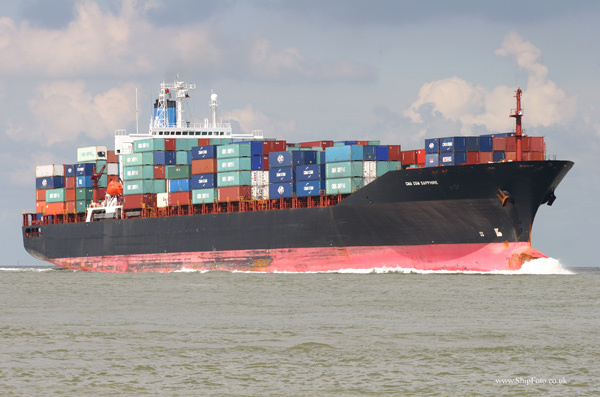 Inward bound in the River Schelde, passing Terneuzen on 2nd June 2002, bound for berth 244/246, Hansadok, Antwerp. Built 1997, 6362 Grt, German flag. 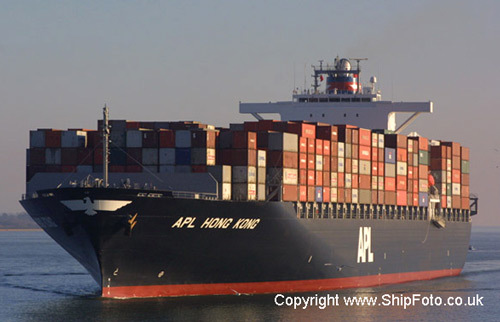 In the anchorage at Istanbul on 23rd September 2004. Photo taken during the TSS Turkish Tour. Built 2004, 27681 Grt, Iranian flag. Inward bound on 18th August 2006, in the River Schelde, passing Terneuzen, bound for berth 742, Delwaidedok, Antwerp, arriving from Hamburg. 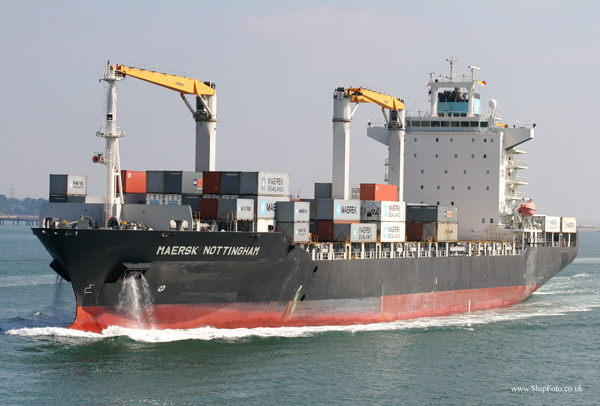 Subsequently departed for Le Havre on 19th August 2006. Built 1982, 19872 Grt, Cypriot flag. Inward bound in the River Schelde, passing Walsoorden, on 21st July 2004, bound for Antwerp. Built 1998, 3999 Grt, British flag. 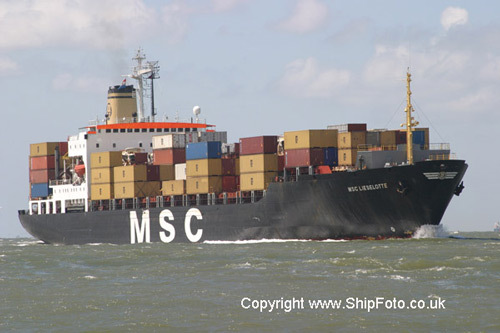 Outward bound in the River Schelde, passing Vlissingen on 25 June 2004 after departing Antwerp for Bremerhaven. Photographed during TSS Continental tour. Built 2001, 30,166 Grt, Danish International flag. 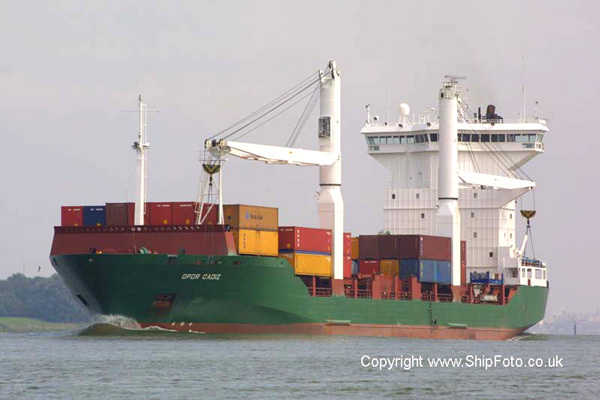 In the New Waterway, bound for Rotterdam on 21st March 2009. 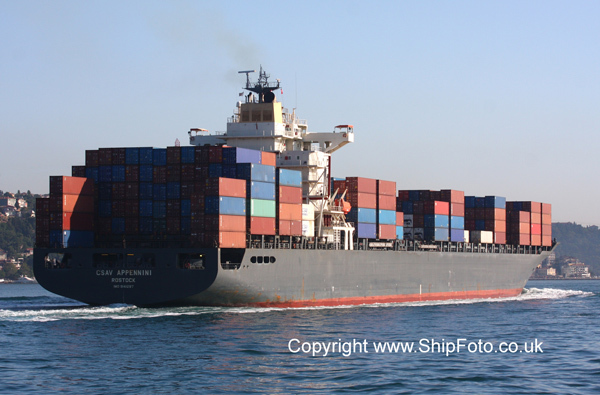 Arriving from Algeciras. Built 2001, 9,981 Grt, Cyprus Flag. 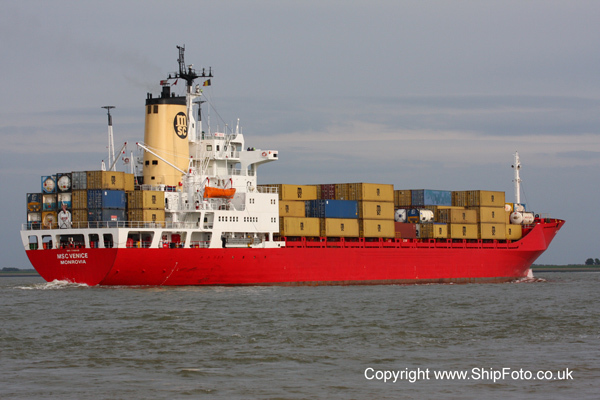 Photographed on 18th April 2008, in the River Elbe, bound for Hamburg, arriving from Umea, Sweden. Built 1998, 6,362 Grt, British Flag. 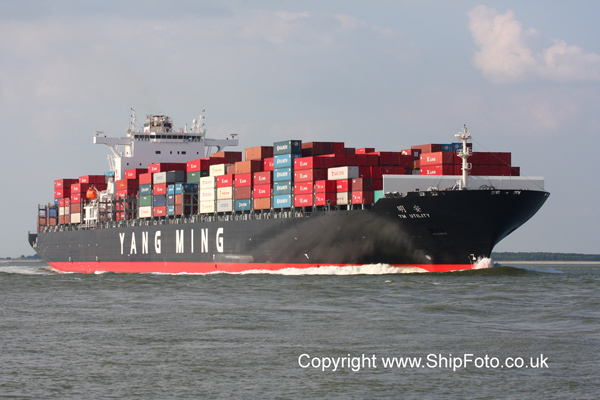 In the River Schelde, on 14th July 2008, bound for Antwerp, from Flushing. Built 2007, 10,308 Grt, Marshall Islands flag. 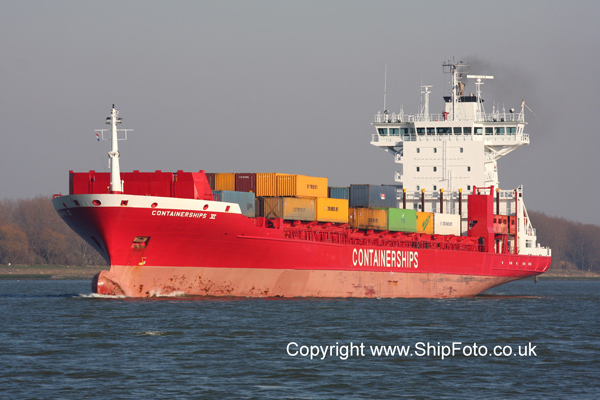 Inward bound in the River Schelde, passing Terneuzen, on 23rd June 2009, whilst on a voyage from Hamburg to Antwerp. Built 1996, 81488 Grt, Danish International flag. 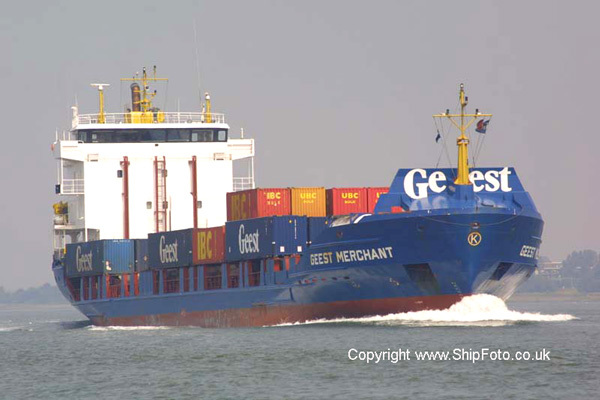 Outward bound in the River Schelde, passing Walsoorden, on 21st July 2004, after departing from Antwerp. Built 1984, 3329 Grt, Netherlands International flag. Inward bound in Southampton Water on 3rd November 2001, bound for Southampton Container Terminal. Built 2007, 17,964 Grt, Marshall Islands flag. 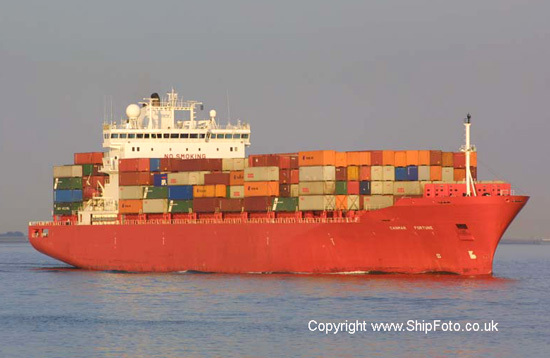 Underway in the River Schelde, on 26th June 2009, whilst on a voyage from Hamburg to Antwerp. Built 1991, 3828 Grt, Finland flag. 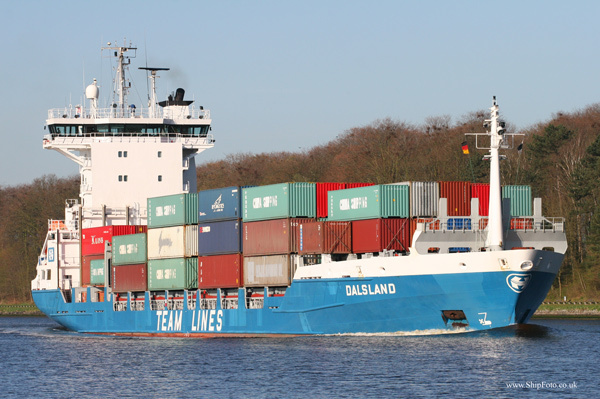 Underway in the Kiel Canal at Rendsburg, Eastbound, on 14th April 2007, whilst on a voyage from Hamburg to Helsinki. Built 1997, 53523 Grt, German flag. Inward bound in Southampton Harbour on 23rd September 2006, bound for berth 206, Western Docks, Southampton. Arriving from Antwerp. 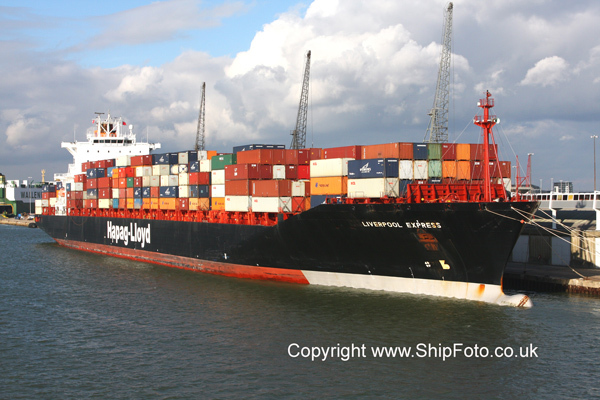 Departed on 24th September for Bremerhaven. Built 1978, 38,991Grt, Singapore flag. 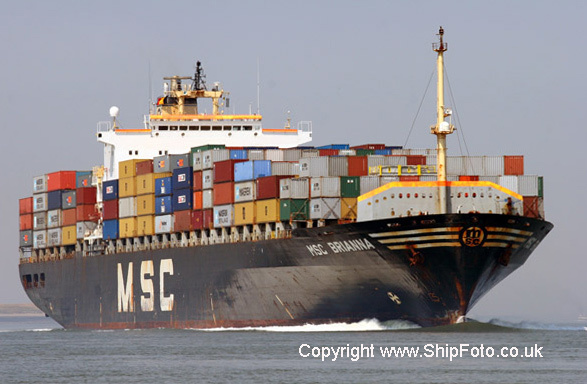 Photographed from Terneuzen in the River Schelde, bound for Antwerp on 25th August 2002. Built 2007, 39906 Grt, Singapore flag. Inward bound in the River Schelde, passing Terneuzen, on 14th August 2007, bound for Antwerp. Arriving from Hamburg. 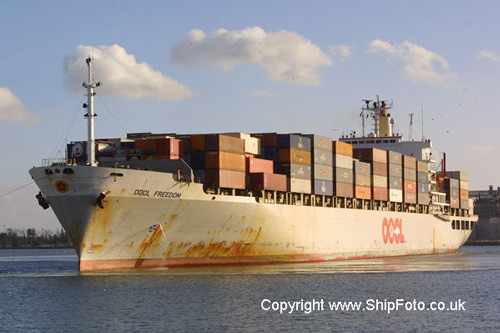 Departed on 15th August for Aden. Built 2006, 15633 Grt, Gibraltar flag. 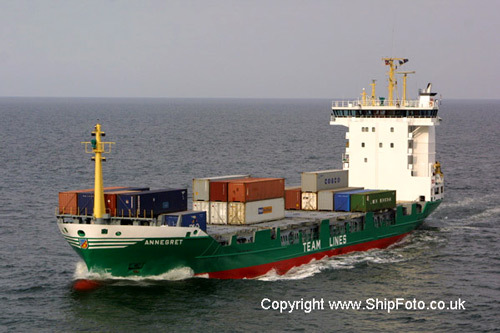 Underway in the Kiel Canal at Rendsburg, Westbound, on 15th April 2007, whilst on a voyage from Klaipeda to Antwerp. Built 1979, 35,748 Grt, Bahamas flag. 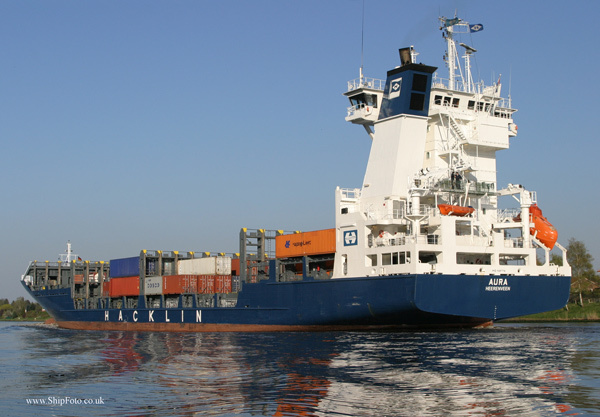 Arriving at Antwerp on 24th June 2009, from Amsterdam. 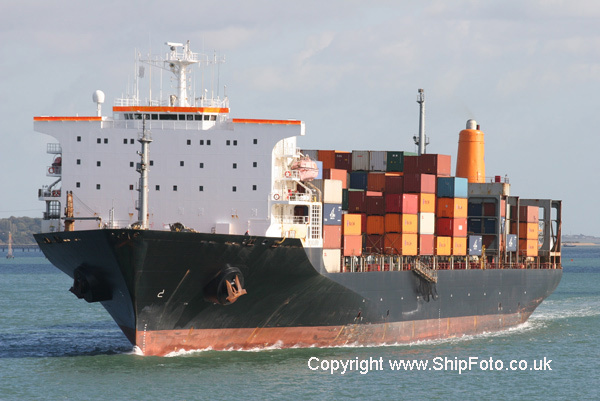 At Southampton on 10th February 2009, having arrived from Le Havre. 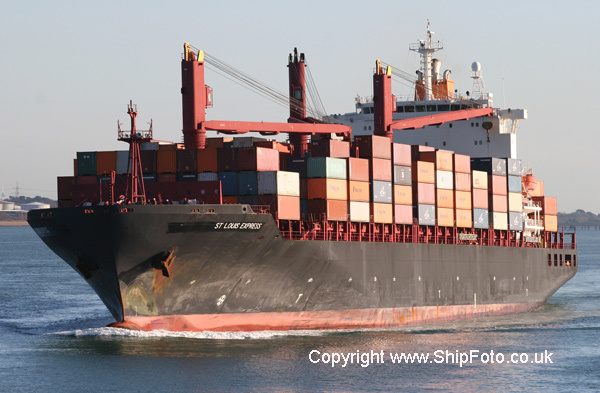 She was undergoing engine repairs at the time which is why she was berthed at the Queen Elizabeth II cruise terminal. Built 2006, 9981 Grt, German flag. 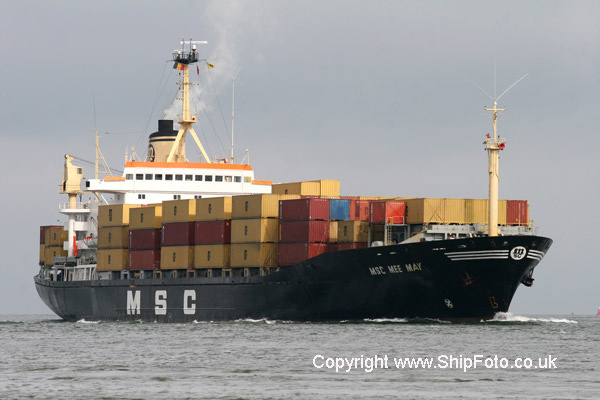 Top : Underway in the Kiel Canal at Rendsburg, Westbound, on 16th April 2007, whilst on a voyage from St. Petersburg to Hamburg. 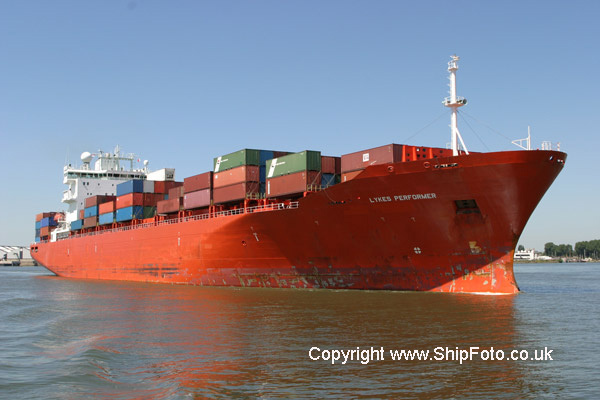 Bottom : Photographed on 21st April 2008, in the River Elbe, bound for Hamburg, having arrived from Bremerhaven. Built 1986, 41023 Grt, Bermuda flag. Inward bound in Southampton Water from New York, bound for Southampton Container Terminal on 2nd May 2004. 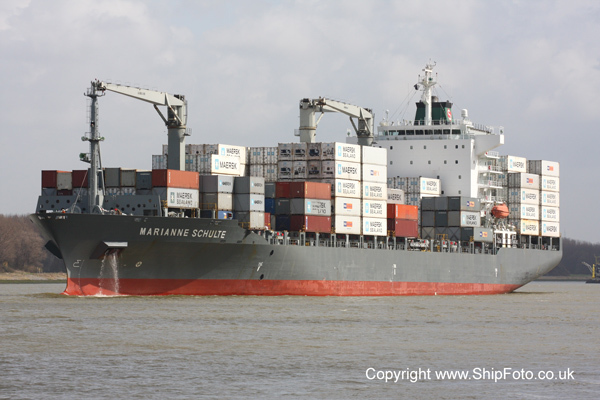 Departed Southampton on 2nd May for Le Havre. Built 1991, 37474 Grt, American flag. Built 1996, 33735 Grt, Bermuda flag. 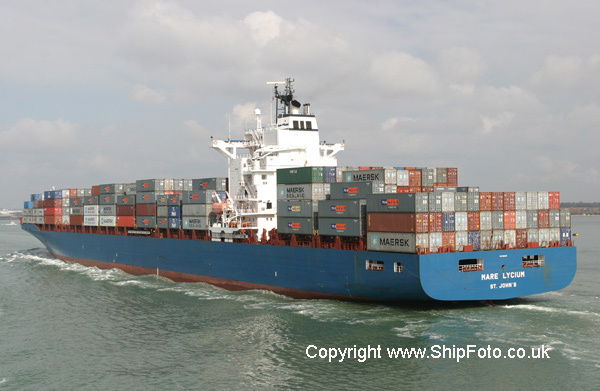 Arriving at Eemshaven, Rotterdam on 19th June 2005. Built 2002, 41834 Grt, Antigua flag. Built 1996, 51,938 Grt, British Flag. 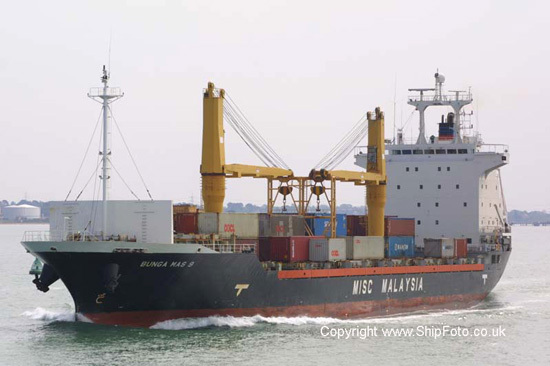 In the New Waterway, on 29th March 2008, bound for Rotterdam, having arrived from Port Klang. Built 2002, 9990 Grt, British flag. 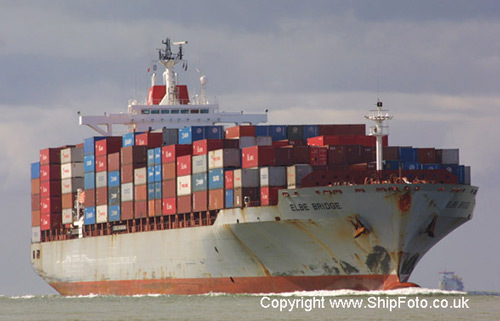 Arriving at Felixstowe on 27th July 2003, from Brest. 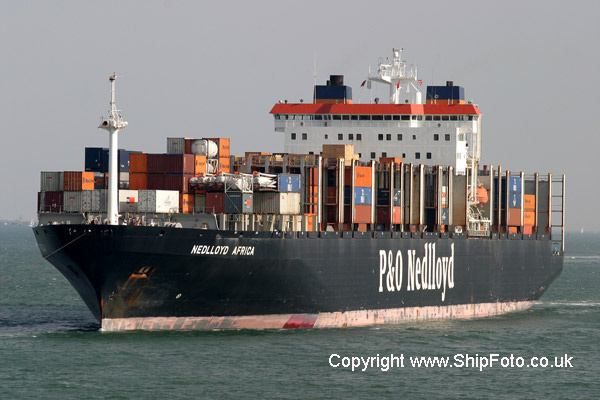 Subsequently departed for Montoir De Bretagne. Built 2004, 26833 Grt, Liberian flag. Inward bound in Southampton Water, bound for berth 204, Western Docks, Southampton, on 8th September 2007, arriving from Caucedo. 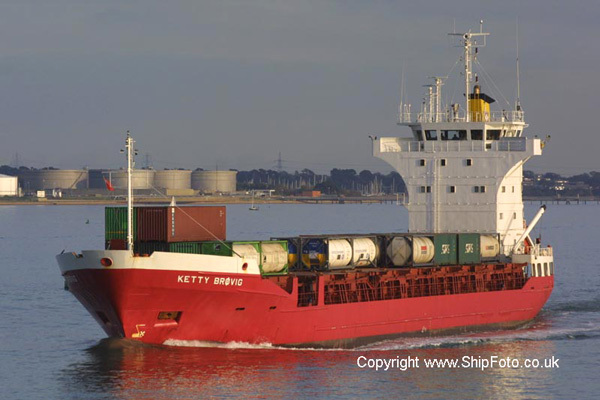 Departed on 9th September for Zeebrugge. Built 2008, 94,193 Grt, Singapore flag. 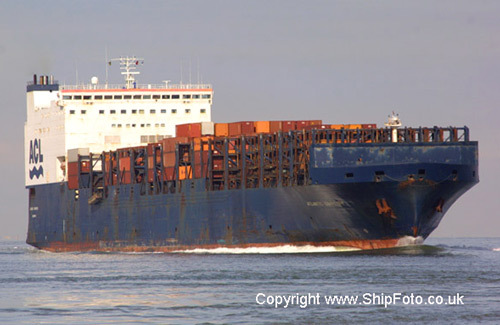 Inward bound in Southampton Water, on 19th March 2009, having arrived from Rotterdam. Built 2005, 17,665 Grt, Turkish Flag. 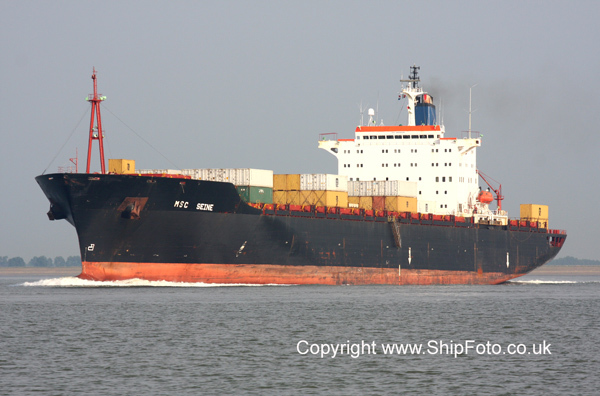 Photographed on 17th June 2008, in the River Schelde, having arrived from Abidjan, Ivory Coast, for Antwerp. Built 2002, 6370 Grt, Antigua flag. Inward bound in the Nieuwe Waterweg on 27th April 2003, bound for Rotterdam, arriving from Waterford. Built 1999, 40306 Grt, Antiguan flag. Inward bound in Southampton Harbour on 16th April 2006, bound for berth 204, Western Docks, Southampton. 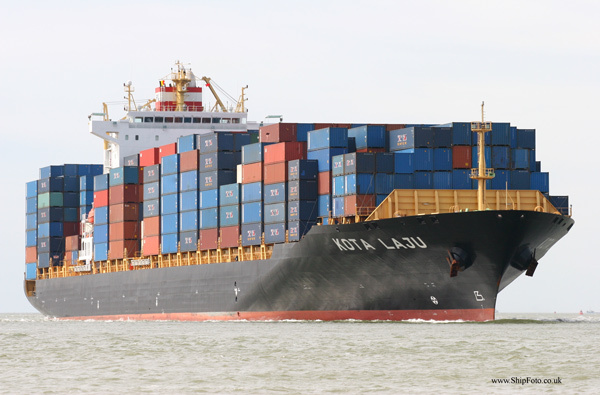 Arriving from Port Klang. 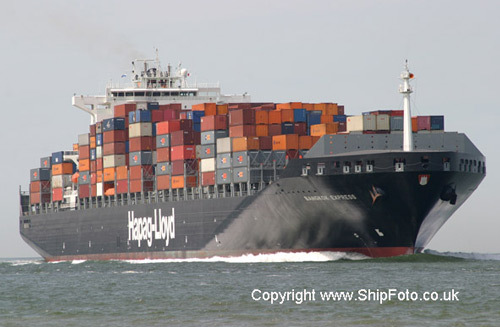 Departed on 17th April for Le Havre. Built 2001, 26,718 Grt, Hong Kong Flag. 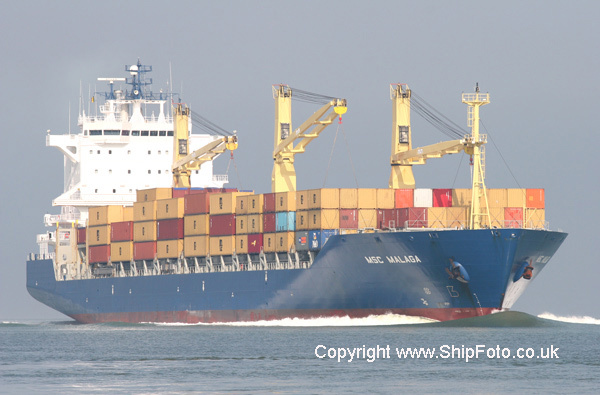 Photographed on 29th March 2008, in the New Waterway, having departed from Rotterdam bound for Algeciras. Built 1995, 3999 Grt, Dutch flag. 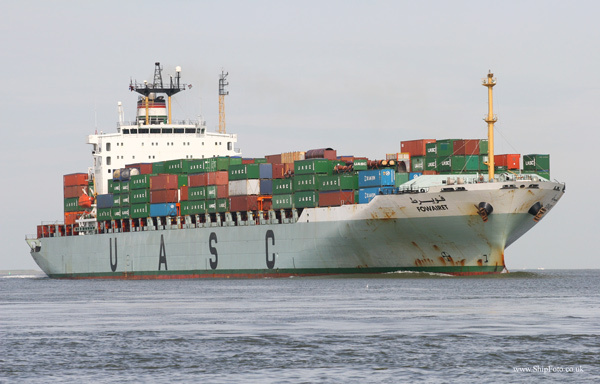 Underway in the Kiel Canal at Rendsburg, Eastbound, on 15th April 2007, whilst on a voyage from Hamburg to Aarhus. Built 1982, 20829 Grt, Bahamas flag. Outward bound in the River Schelde, passing Walsoorden on 16th August 2006, having departed from berth 422/424, Churchilldok, Antwerp, bound for Felixstowe. 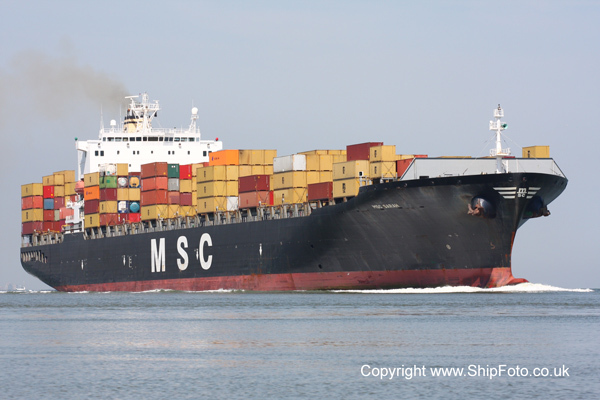 Previously arrived on 14th August from Hamburg. Built 2001, 66332 Grt, Panama flag. Inward bound in Southampton Water from Hamburg, bound for Southampton Container Terminal on 9th April 2004. Departed on 10th April 2004 for Le Havre. 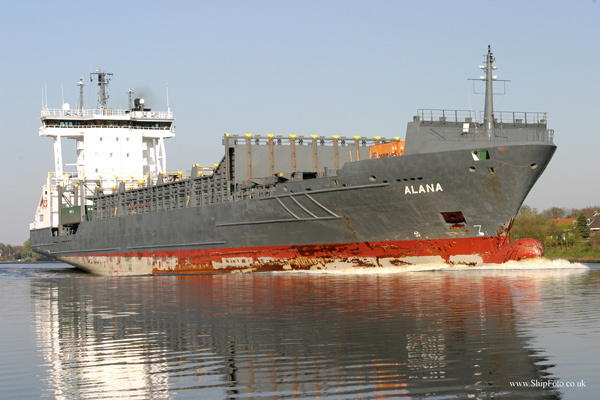 Built 2005, 71902 Grt, Panama flag. Outward bound in the Solent off Cowes, having departed from berth 204, Western Docks, on 5th May 2007, bound for Le Havre. 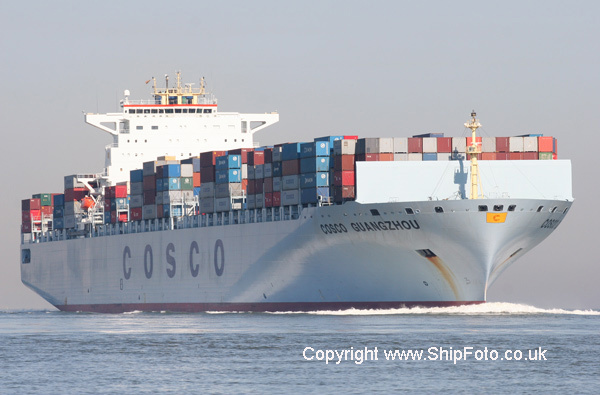 Previously arrived on 4th May from Hamburg. Built 2003, 26,061 Grt, Cyprus Flag. 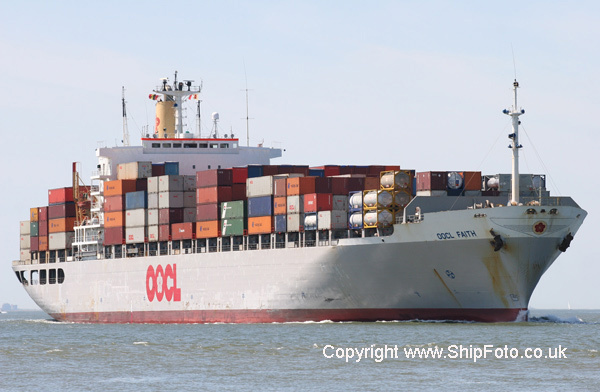 In the River Schelde, on 16th July 2008, arriving from Le Havre, bound for Antwerp. Built 1996, 16,800 Grt, Liberian Flag. 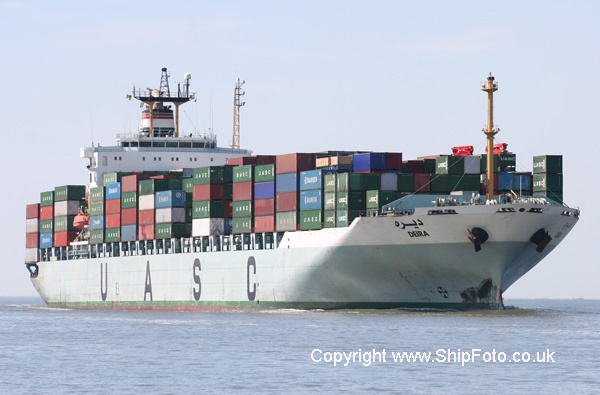 In the River Schelde, on 16th July 2008, arriving from Thamesport, bound for Antwerp. Built 1998, 25219 Grt, Panama flag. Inward bound in the River Schelde on 24th June 2005, passing Terneuzen, bound for Antwerp. 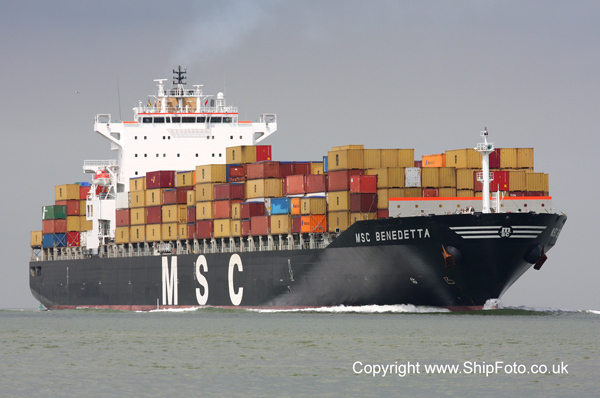 Arriving from Felixstowe. Built 1978, 20408 Grt, Maltese flag. 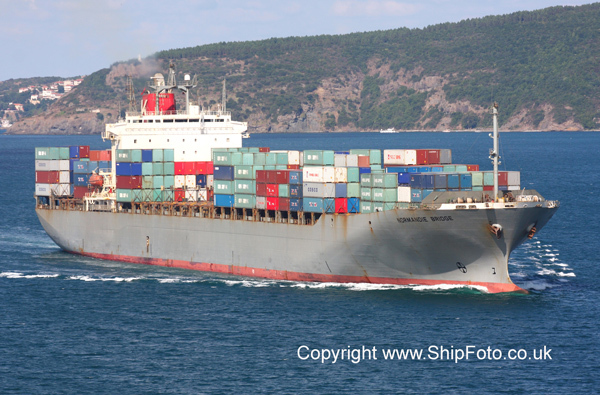 Underway in the Bosphorus, passing Rumeli Kavagi, Southbound, on 30th June 2006, whilst on a voyage from Constantza to Ambarli. Built 1999, 13066 Grt, Liberian flag. Inward bound in the River Schelde, passing Terneuzen, bound for berth 724, Delwaidedok, Antwerp on 21st July 2006 , having arrived from Hamburg. 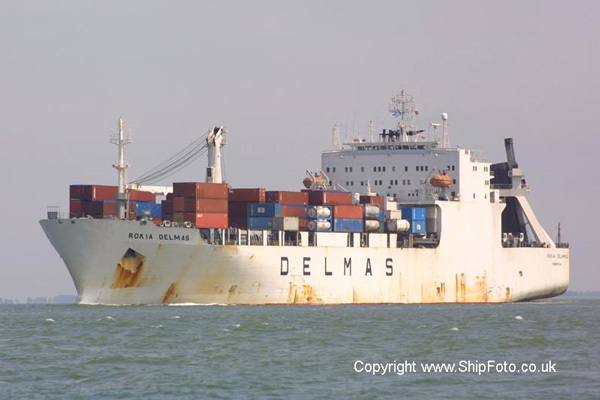 Subsequently departed on 22nd July from Antwerp, bound for Las Palmas. Built 2000, 40631 Grt, Panama flag. 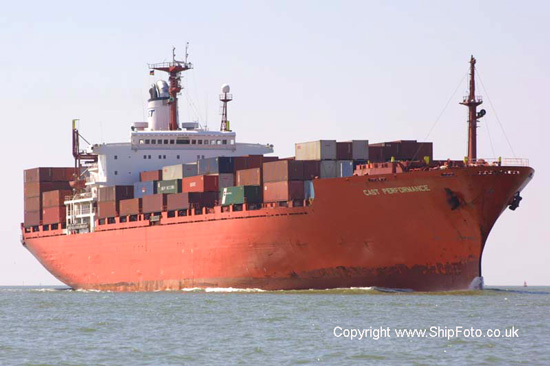 Photographed inward bound in the River Schelde, passing Terneuzen, bound for Antwerp on 26th August 2002. Built 2000, 24836 Grt, Panama flag. Inward bound in the River Schelde, passing Terneuzen, bound for berth 712, Delwaidedok, Antwerp, on 21st July 2006, having arrived from Felixstowe. 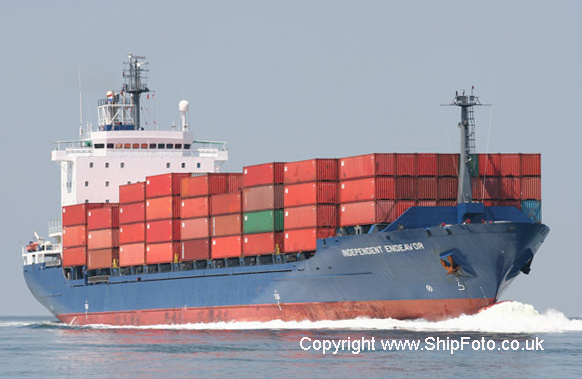 Subsequently departed on 23rd July from berth 726/728, Delwaidedok, Antwerp, bound for Istanbul. Built 2006, 54,214 Grt, Marshall Islands Flag. 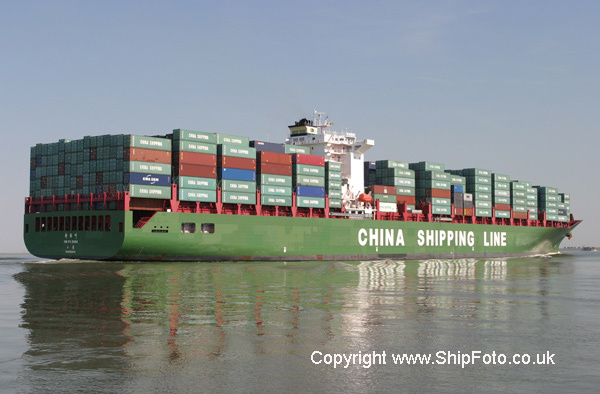 Photographed on 20th June 2008, in the River Schelde, arriving from Hamburg, bound for Antwerp. Built 1986, 40177 Grt, Panama flag. Inward bound in the River Schelde on 24th June 2005, passing Terneuzen, bound for Antwerp. Arriving from Montreal. Built 1997, 36606 Grt, Liberian flag. Inward bound in the River Schelde, passing Terneuzen, bound for berth 724/726, Delwaidedok, Antwerp on 2nd June 2002. 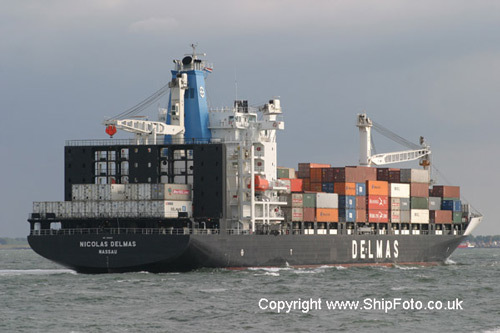 Departed Antwerp on 4th June 2002 for Piraeus. Built 1986, 35953 Grt, Panama flag. 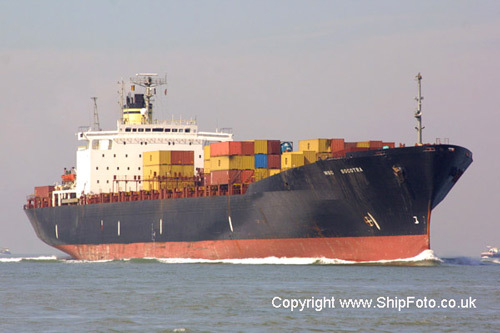 Inward bound in the River Schelde on 15th June 2003, passing Terneuzen, bound for Antwerp. Built 1984, 17700 Grt, Panama flag. Inward bound in the River Schelde, passing Walsoorden, on 16th August 2007, bound for berth 706/710 Delwaidedok, Antwerp. Arriving from Leixoes. Departed on 18th August for Dublin. Built 2004, 35954 Grt, Liberian flag. 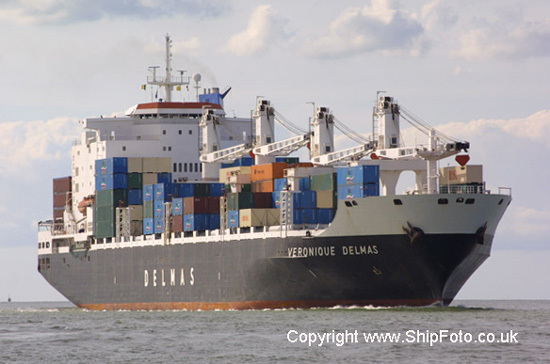 Inward bound in the River Schelde, passing Terneuzen, bound for berth 704, Delwaidedok, Antwerp, on 17th July 2006, having arrived from Las Palmas. 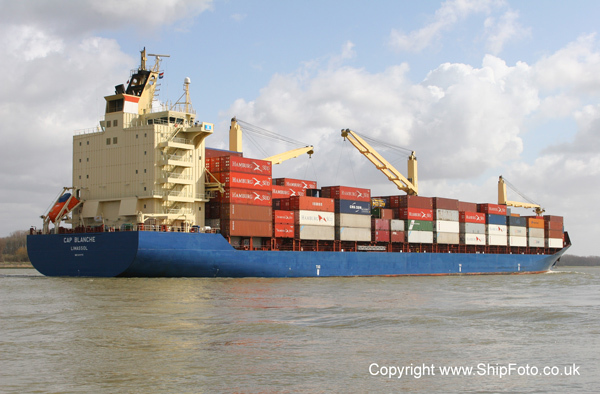 Subsequently departed on 19th July from Antwerp, bound for Rotterdam. Built 1996, 29181 Grt, Panama flag. Inward bound in the River Schelde, passing Terneuzen, bound for berth 718/720, Antwerp on 25th August 2002. 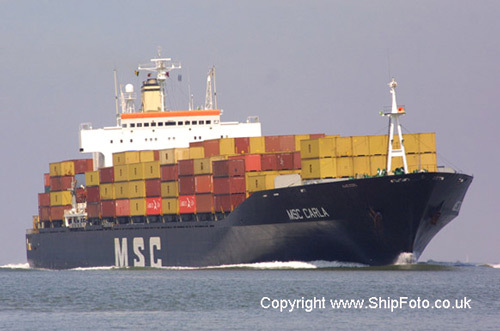 Departed Antwerp on 29th August 2002 for Valencia. Built 1996, 50,644 Grt, German flag. 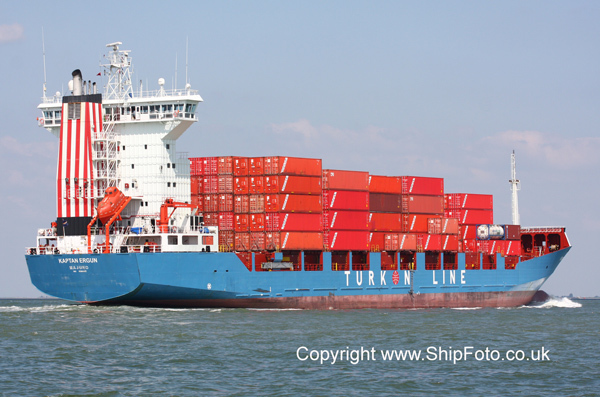 Inward bound in the River Schelde, passing Terneuzen, on 23rd June 2009, arriving from Felixstowe. Built 1993, 53521 Grt, Panama flag. 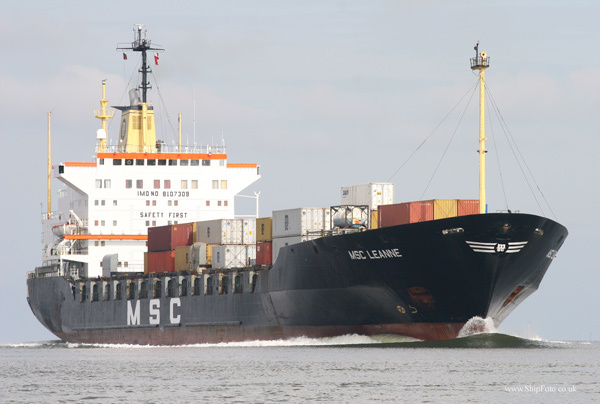 Outward bound in the River Schelde, passing Walsoorden on 16th August 2007, after departing from Antwerp, bound for Piraeus. 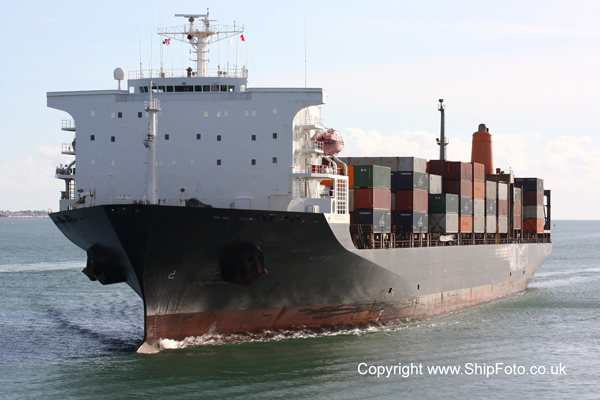 Previously arrived on 14th August from Felixstowe. Built 1982, 21586 Grt, Panama flag. 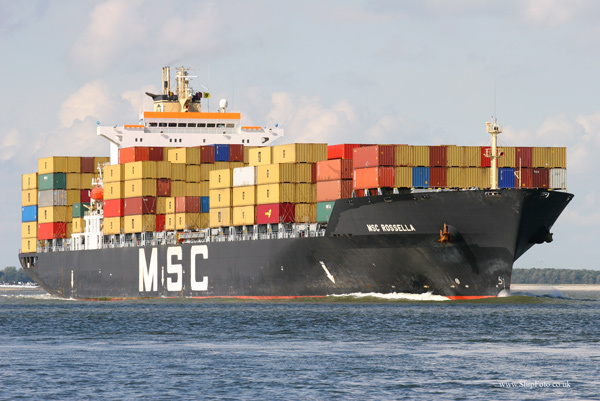 Inward bound in the River Schelde, passing Terneuzen on 18th August 2004, bound for Antwerp. 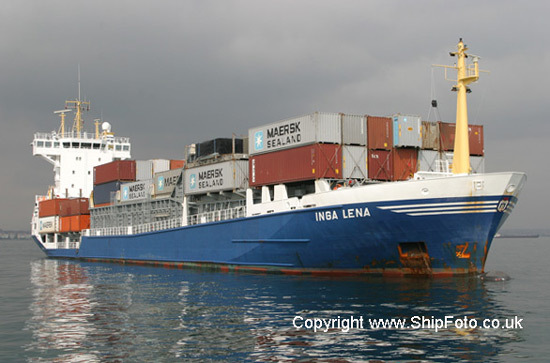 Departed from Antwerp on 20th August 2004 for Riga. Built 2001, 75590 Grt, German flag. Inward bound in the River Schelde, passing Terneuzen, bound for berth S.857/S.861, Antwerp on 29th August 2002. 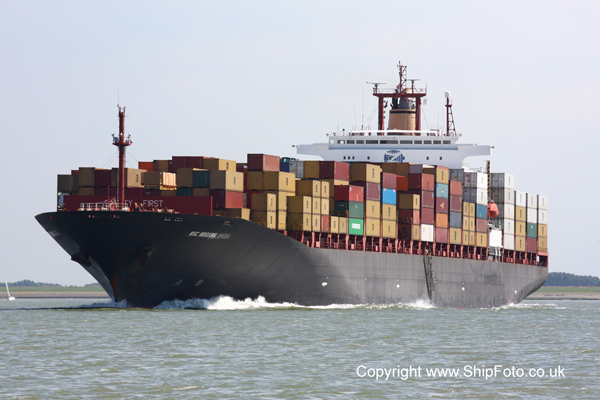 Arriving from Felixstowe. 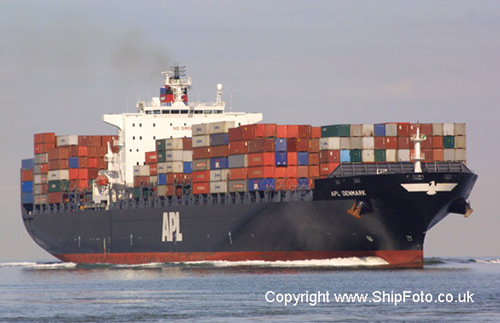 Departed Antwerp on 30th August 2002 for Singapore via Piraeus. Built 1991, 13258 Grt, Panama flag. 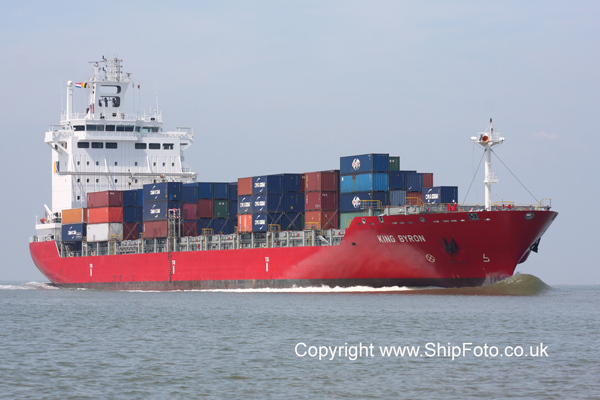 Top : Inward bound in the River Schelde on 16th June 2003, passing Terneuzen, bound for Antwerp. 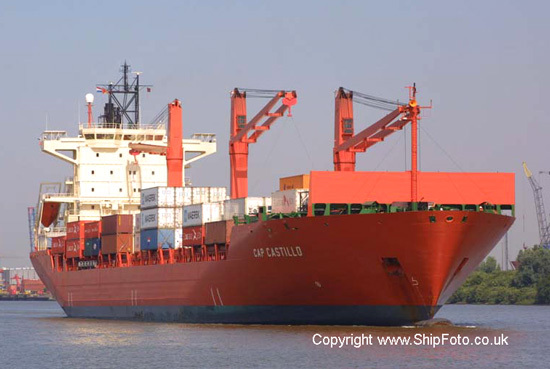 Bottom : In the River Schelde, outward bound from berth 232/234, Hansadok, Antwerp, on 26th May 2007, bound for Rotterdam. 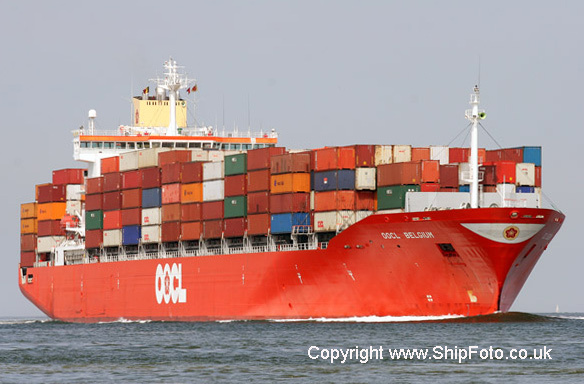 Previously arrived on 23rd May from Gdynia. Built 1984, 21585 Grt, Panama flag. 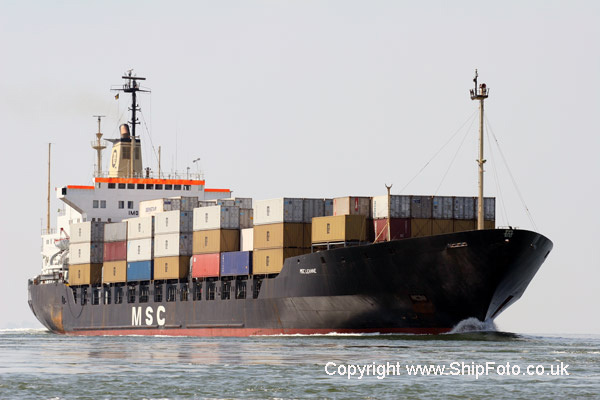 Inward bound in the River Schelde on 20th June 2004, passing Terneuzen, bound for Antwerp. Photographed during TSS Continental tour. 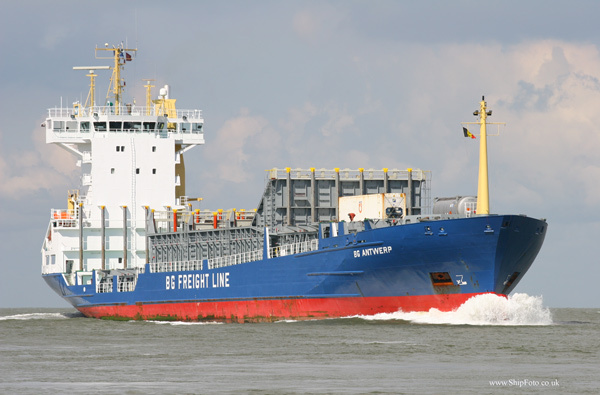 Inward bound in the River Schelde on 17th July 2005, passing Terneuzen, bound for Antwerp. Subsequently departed Antwerp for Aarhus. 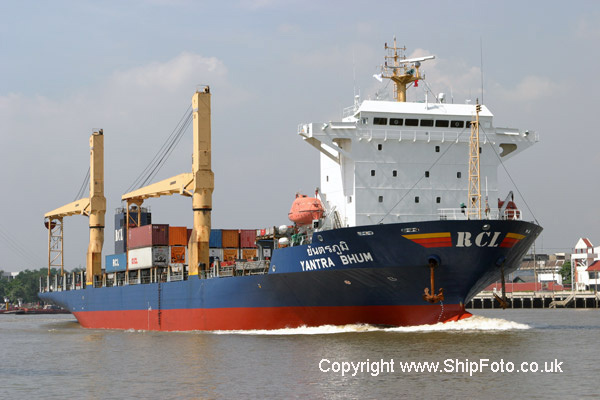 Built 2006, 107551 Grt, Panama flag. Inward bound in the River Schelde, passing Walsoorden, on 18th July 2006, bound for berth 708, Delwaidedok, Antwerp, arriving from Le Havre. 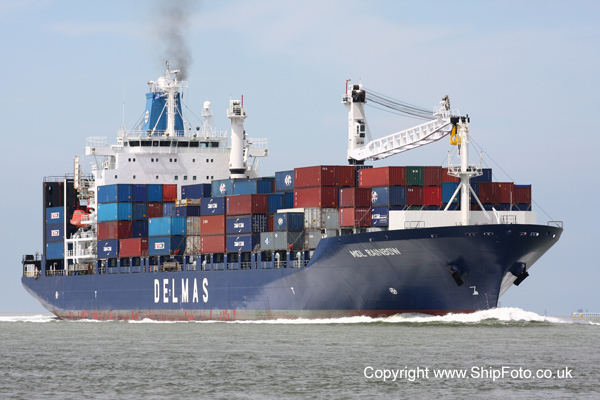 Departed on 20th July from Antwerp, bound for Felixstowe. On maiden voyage from Busan/Shanghai/Ningbo/Hong Kong/Singapore. Built 1972, 51608 Grt, Panama flag. Inward bound in the River Schelde, passing Terneuzen, bound for berth S.861/S.865, Antwerp on 29th August 2002. Arriving from New York. Built 1994, 42323 Grt, Liberian flag. Inward bound in the River Schelde on 3rd September 2003, passing Terneuzen, bound for berth 724/726, Delwaidedok, Antwerp. 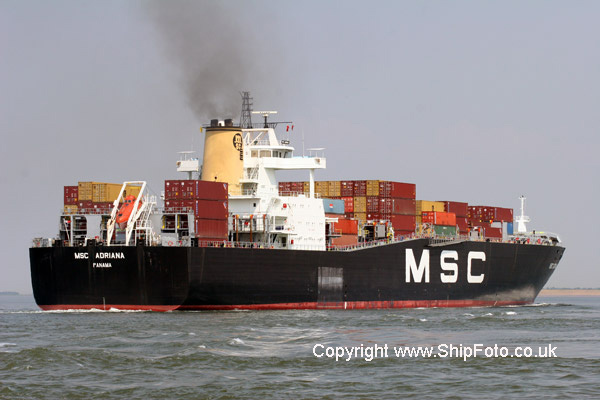 Departed on 5th September 2003 for Bremen. Built 1996, 37518 Grt, Panama flag. Inward bound in the River Schelde on 23rd June 2005, passing Terneuzen, bound for berth 1233, Antwerp. Arriving from Hamburg. Built 1983, 17702 Grt, Panama flag. 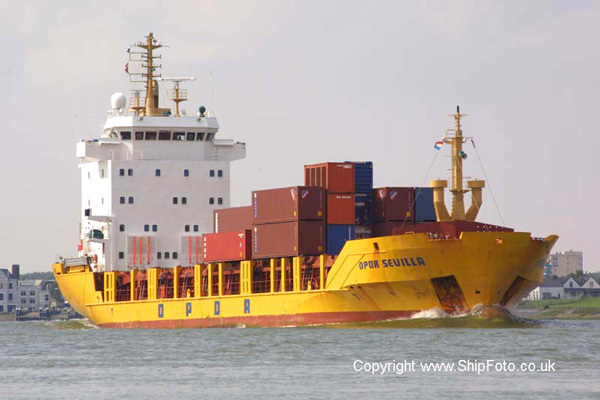 Top : Inward bound in the River Schelde on 17th July 2005, passing Terneuzen, bound for Antwerp. 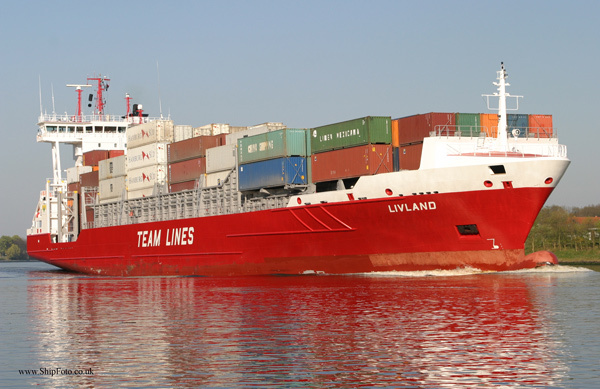 Subsequently departed Antwerp for Liverpool. 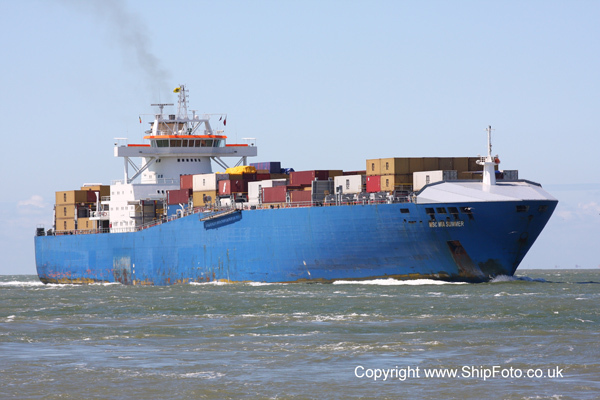 Middle : In the River Schelde, passing Terneuzen, on 28th May 2007, inward bound for Antwerp. Arriving from Vigo. 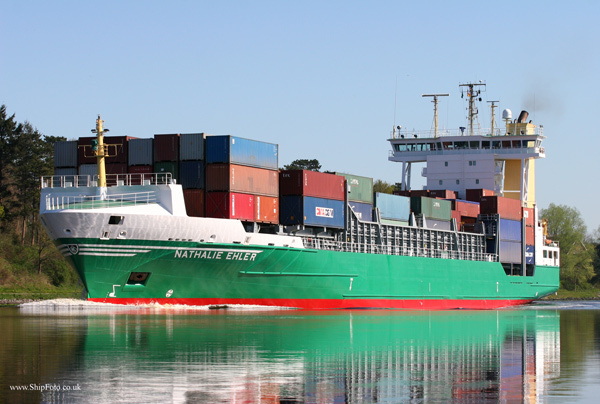 Departed on 29th May for Dublin. 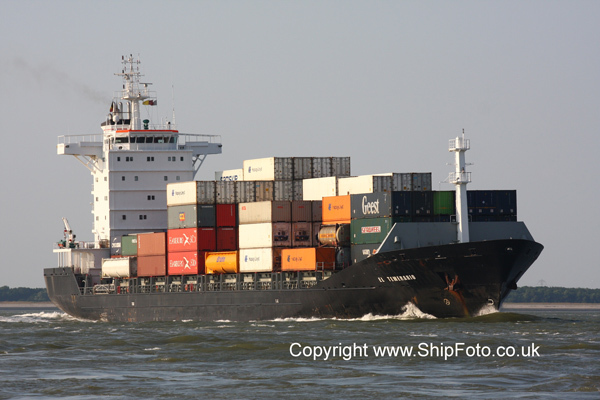 Bottom : Photographed on 14th July 2008, in the River Schelde, bound for Antwerp, arriving from Dublin. Built 1989, 36420 Grt, Panama flag. 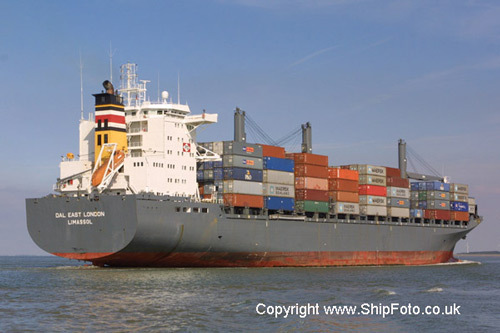 Inward bound in the River Schelde, passing Walsoorden, on 20th July 2004, bound for Antwerp. Built 1983, 21586 Grt, Panama flag. 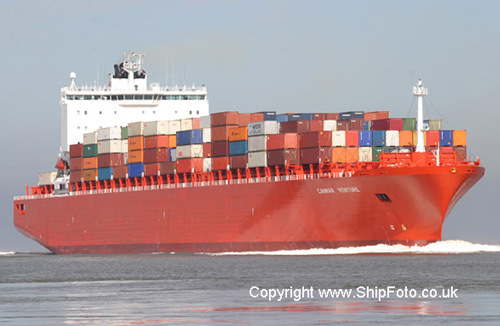 Top : Inward bound in the River Schelde on 25th June 2004, passing Terneuzen, bound for Antwerp from Gothenburg. 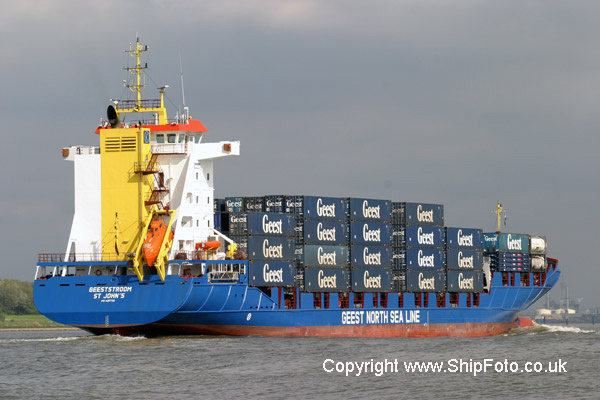 Departed Antwerp on 29th June 2004 for Gothenburg. Photographed during TSS Continental tour. 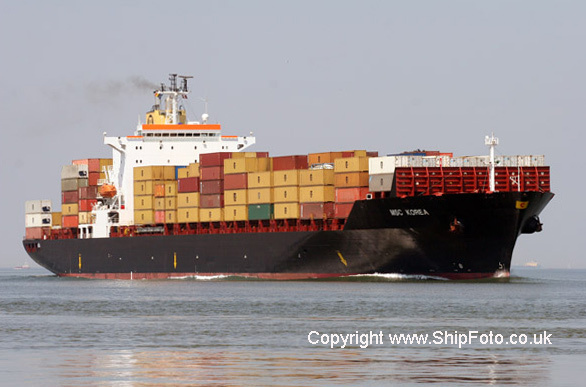 Bottom : In the River Schelde, on 14th July 2008, bound for Antwerp, arriving from Kotka, Finland. 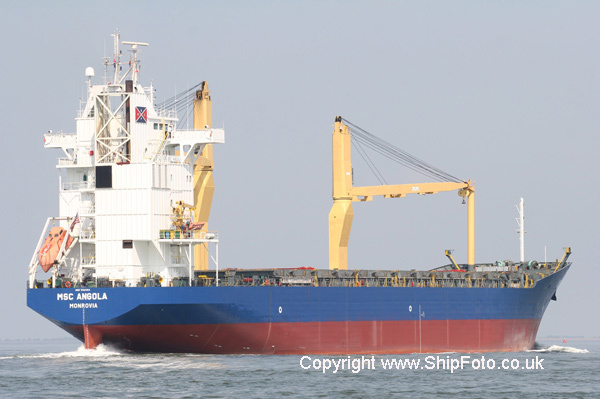 Built 2004, 53500 Grt, Panama flag. Inward bound in the River Schelde on 25th June 2004, passing Terneuzen, bound for Antwerp from Liverpool. 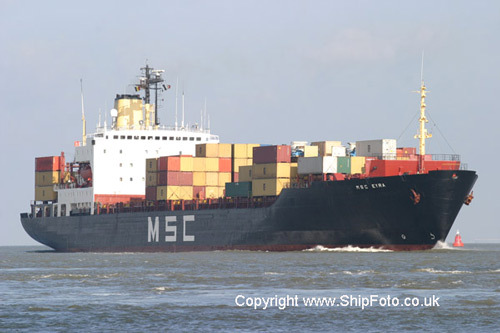 Departed Antwerp on 27th June 2004 for Hamburg. Photographed during TSS Continental tour. Built 1980, 33,113 Grt, Panama Flag. 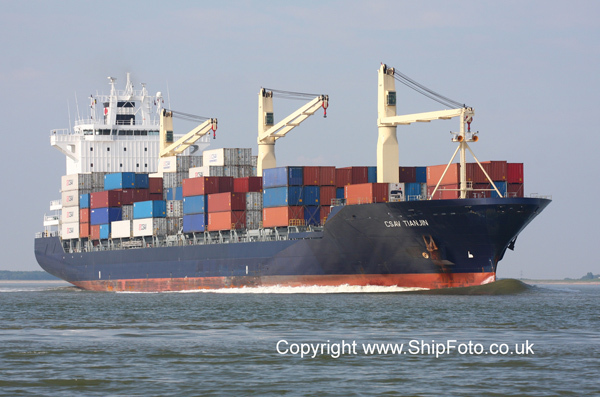 Photographed on 16th July 2008, in the River Schelde, bound for Antwerp, arriving from Santa Cruz de Tenerife. Built 1998, 25713 Grt, German flag. Inward bound in the River Schelde, passing Terneuzen, bound for berth 716, Delwaidedok, Antwerp, on 16th August 2006, having arrived from Montreal. 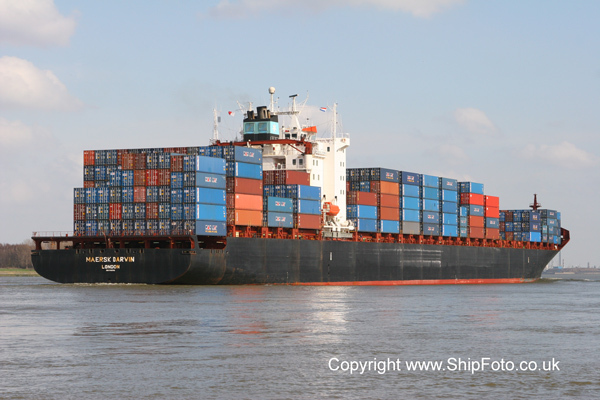 Subsequently departed on 17th August from Antwerp, bound for Felixstowe. Built 1970, 16670 Grt, Panama flag. Inward bound in the River Schelde on 2nd June 2005, passing Terneuzen, bound for berth 726/728, Delwaidedok, Antwerp. Subsequently departed on 3rd June for Liverpool. Built 1995, 60,117 Grt, British Flag. 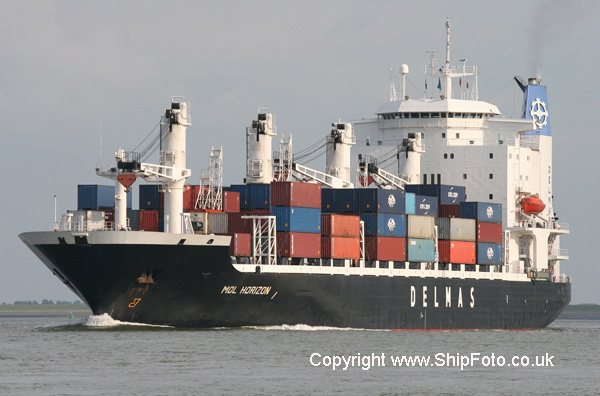 Photographed on 14th July 2008, in the River Schelde, having departed from Antwerp, bound for Las Palmas. 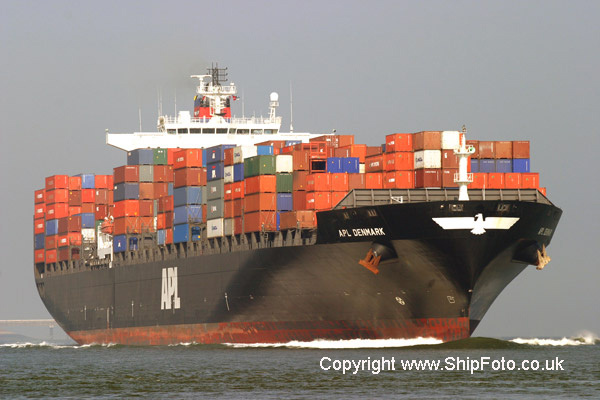 Built 1999, 25,219 Grt, Panama Flag. 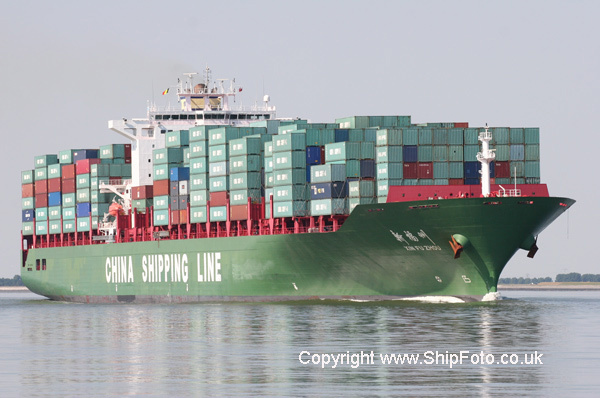 In the River Schelde, on 13th July 2008, bound for Antwerp, arriving from Felixstowe. 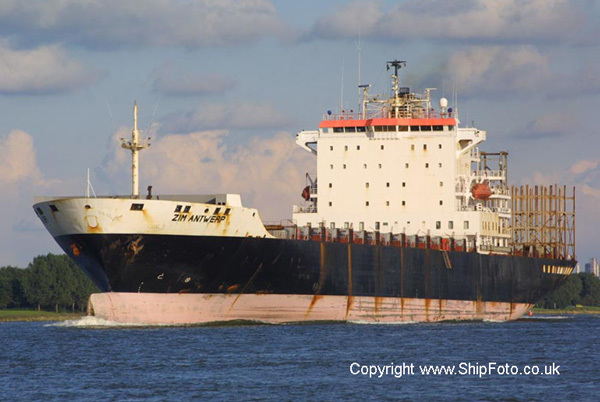 Built 1980, 32,629 Grt, Panama Flag. 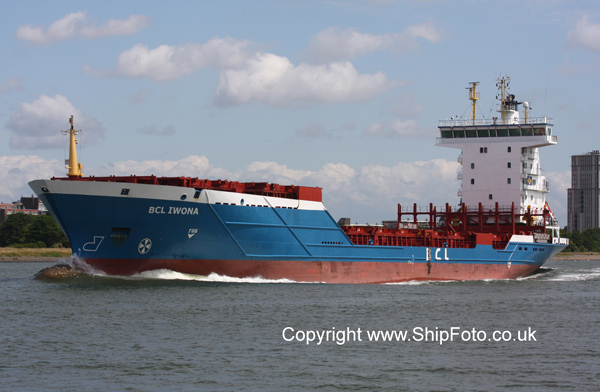 Photographed on 14th July 2008, in the River Schelde, having departed from Antwerp, bound for Barcelona. Built 1986, 35610 Grt, Panama flag. Inward bound in the River Schelde, passing Terneuzen, bound for berth 728, Antwerp on 29th August 2002. 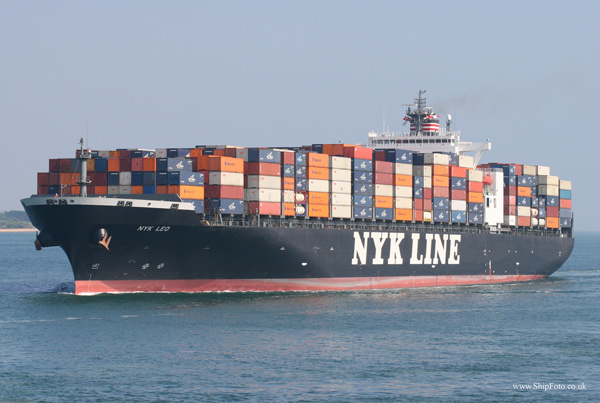 Arriving from Le Havre. 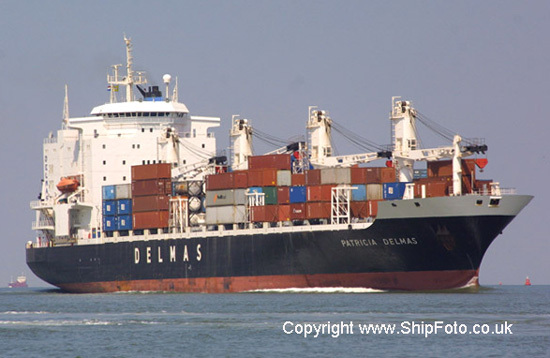 Departed Antwerp on 31st August 2002 for Piraeus. Built 1983, 20345 Grt, Panama flag. 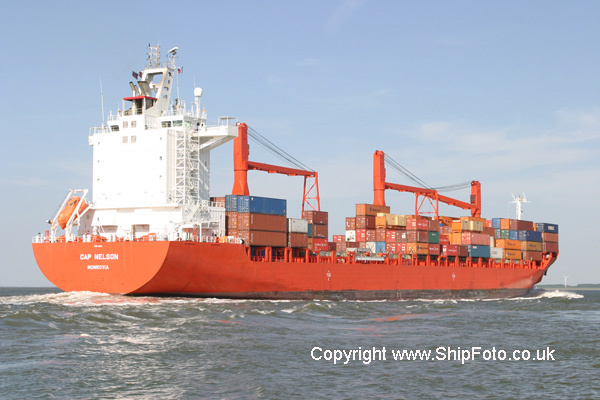 In the River Schelde, passing Terneuzen, on 25th May 2007, inward bound for berth 728, Delwaidedok, Antwerp. Arriving from Bremerhaven. 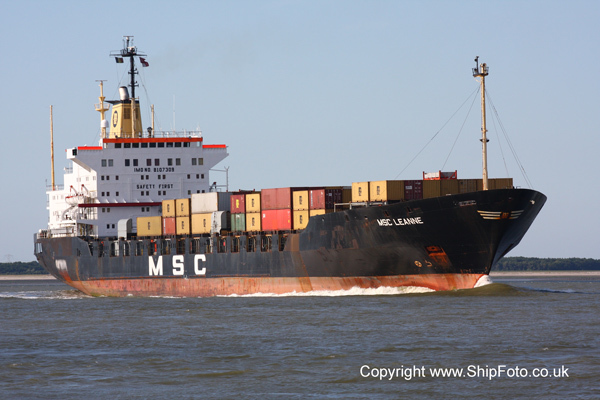 Departed on 26th May for Tilbury. Built 1979, 36,133 Grt, Panama flag. 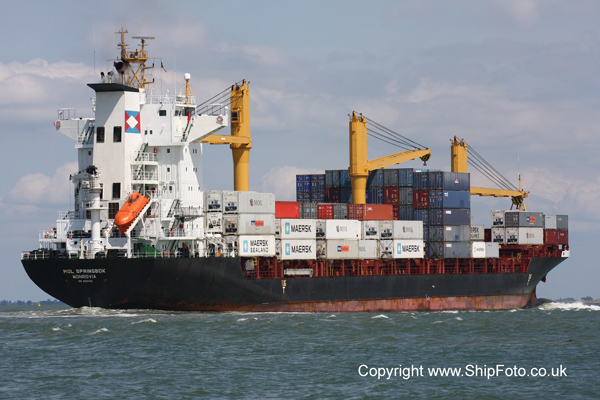 Outward bound in the River Schelde, passing Walsoorden, on 26th June 2009, having departed from Antwerp for Liverpool. Built 1974, 39499 Grt, Panama flag. Inward bound in the River Schelde, passing Terneuzen, bound for berth S.859, Antwerp on 1st August 2001. 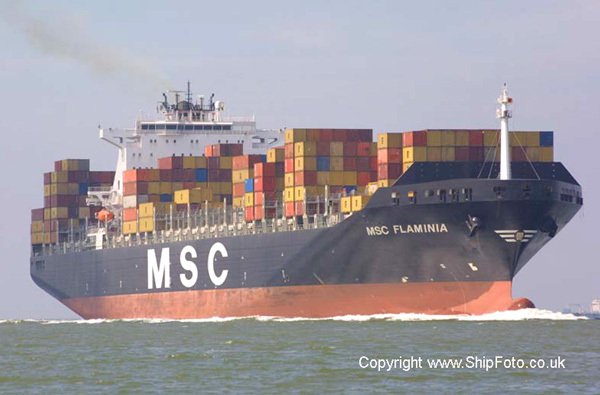 Subsequently sailed for Bremen on 3rd August 2001. Built 1993, 37398 Grt, Panama flag. Inward bound in the River Schelde, passing Walsoorden, on 16th August 2007, bound for berth 726/728 Delwaidedok, Antwerp. 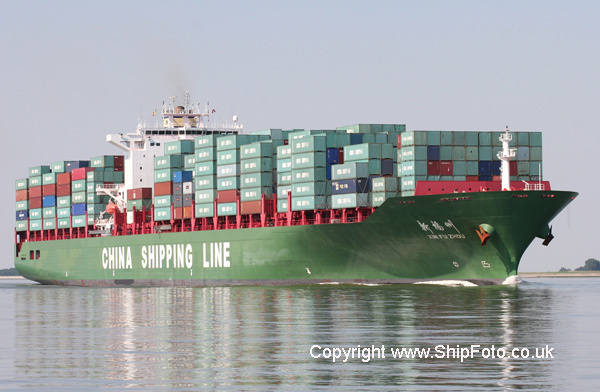 Arriving from Felixstowe. 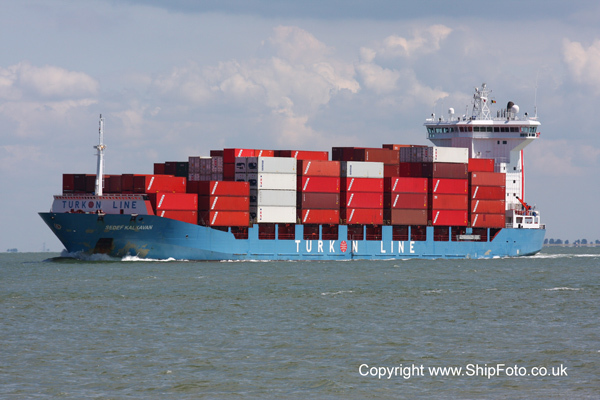 Departed on 24th August for Le Havre. Built 1989, 35598 Grt, Panama flag. Inward bound in the River Schelde, passing Terneuzen, bound for berth 718, Delwaidedok, Antwerp, on 20th July 2006, having arrived from Montreal. 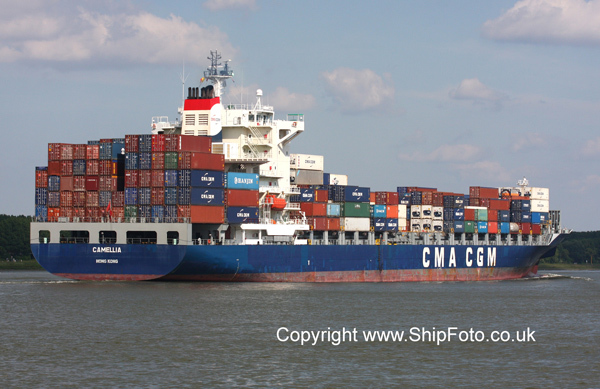 Subsequently departed on 21st July from Antwerp, bound for Liverpool. Built 1973, 40944 Grt, Panama flag. 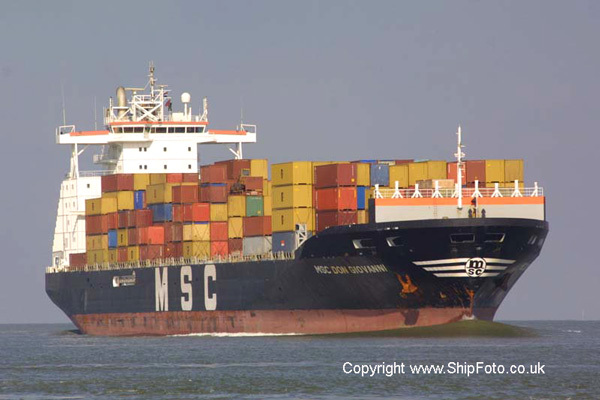 Outward bound in the River Schelde, passing Terneuzen on 8th September 2001 after departing from Antwerp. Built 2000, 53,208 Grt, Panama Flag. 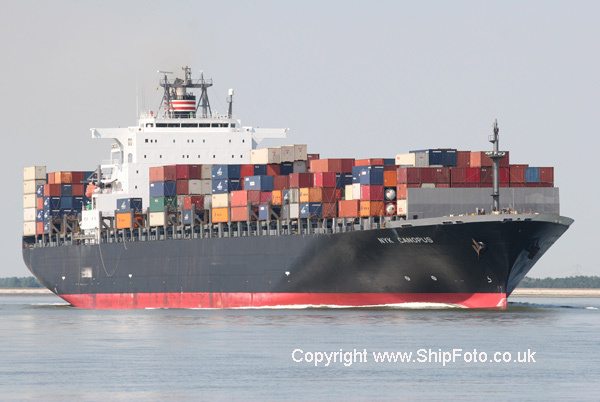 In the River Schelde, on 17th June 2008, bound for Antwerp, arriving from Felixstowe. Built 1991, 8,908 Grt, Turkish Flag. In the Bosphorus on 14th August 2009, whilst on a voyage from Poti, Georgia to Ambarli, Turkey. Built 1990, 37,193 Grt, Marshall Islands Flag. 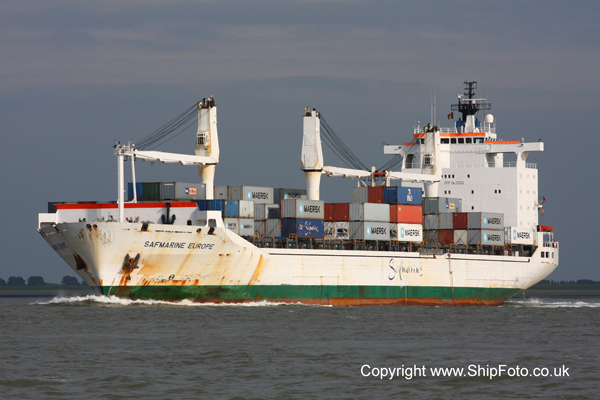 In the River Schelde on 26th June 2009, having departed from Antwerp, bound for Bremerhaven. Built 1977, 38991 Grt, Panama flag. 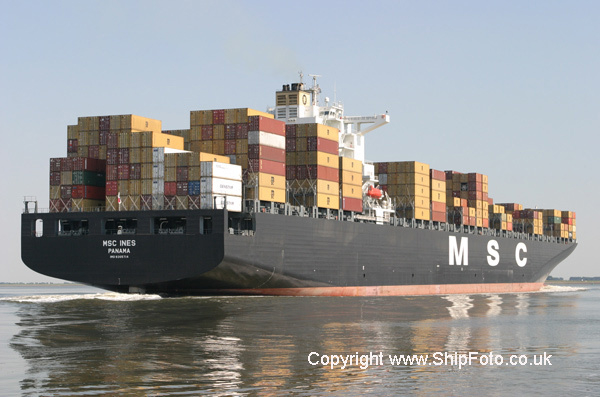 Inward bound in the River Schelde, passing Terneuzen, on 24th July 2004, bound for Antwerp from Felixstowe. 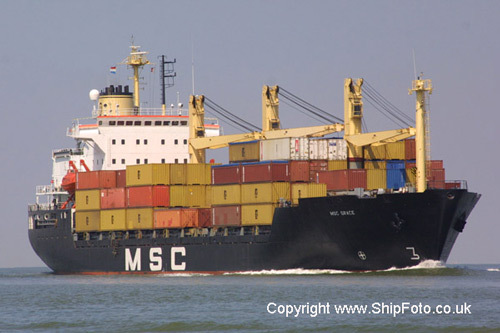 Departed from Antwerp on 25th July 2004 bound for Suez. Built 1980, 35065 Grt, Liberian flag. Inward bound in the River Schelde, passing Terneuzen on 5th September 2003, bound for berth 724, Delwaidedok, Antwerp. 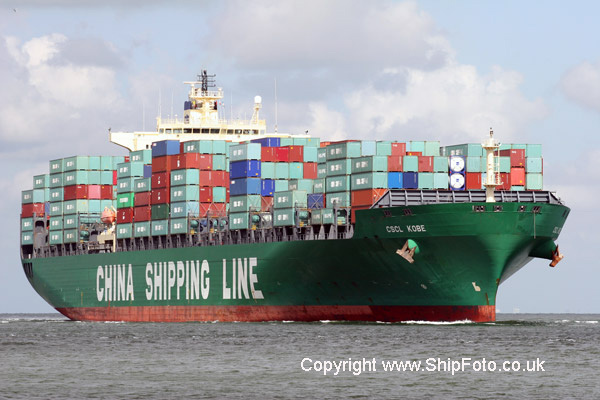 Arriving from Felixstowe. 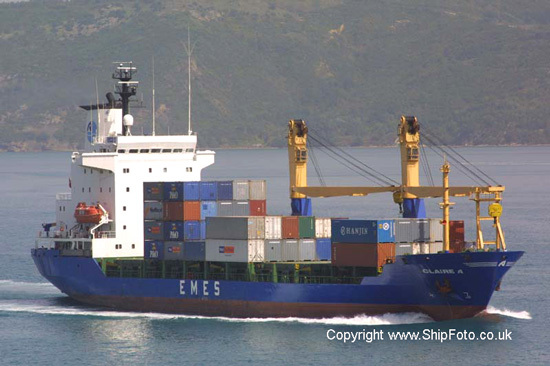 Departed on 7th September 2003 for Piraeus. Built 1977, 52615 Grt, South Africa flag. 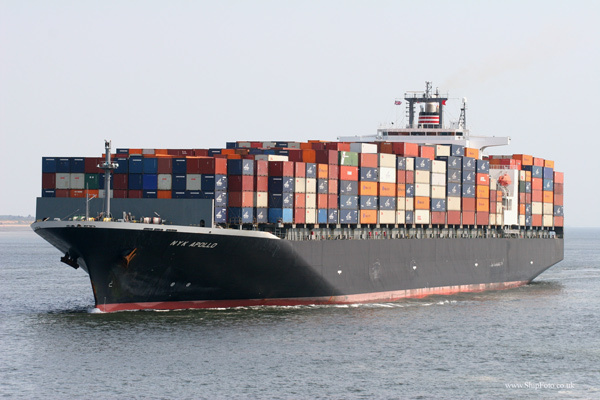 Inward bound in the River Schelde, passing Terneuzen on 31st July 2001bound for berth 718/720 Antwerp. 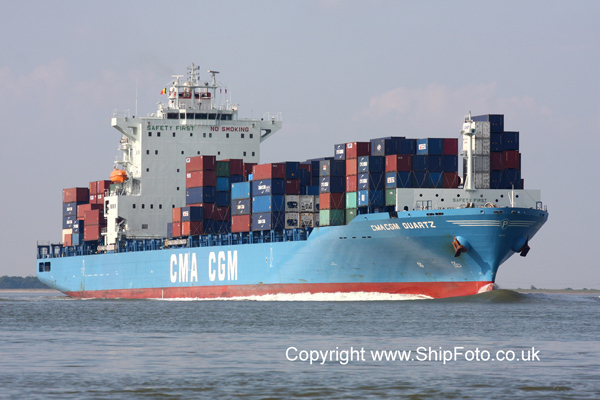 Subsequently departed for Bremerhaven. Built 1978, 16471 Grt, Liberian flag. 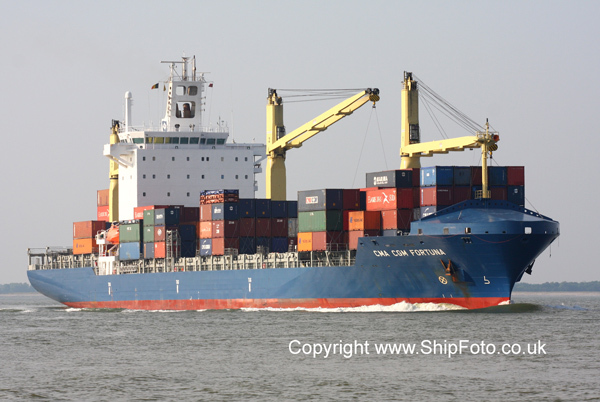 Top : Inward bound in the River Schelde on 23rd June 2005, passing Terneuzen, bound for berth 724, Delwaidedok, Antwerp. Arriving from Hamburg. 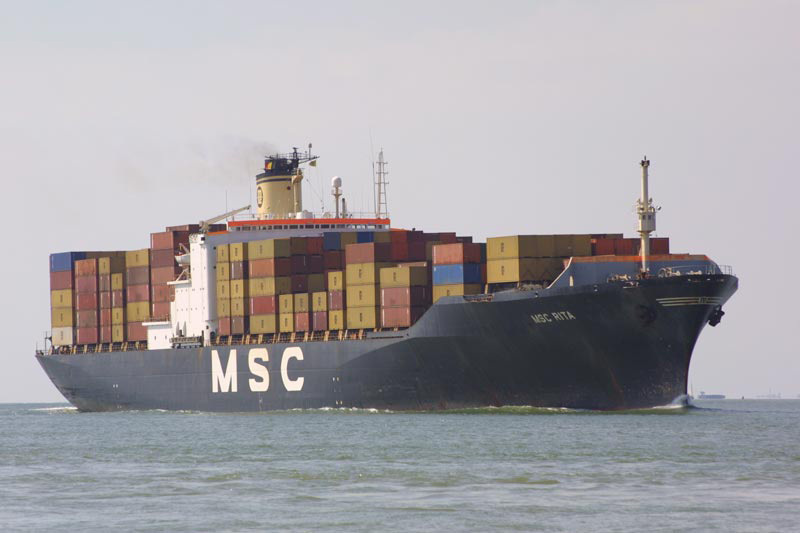 Middle : Inward bound in the River Schelde, passing Terneuzen, on 13th August 2007, bound for Antwerp. Arriving from Dublin. 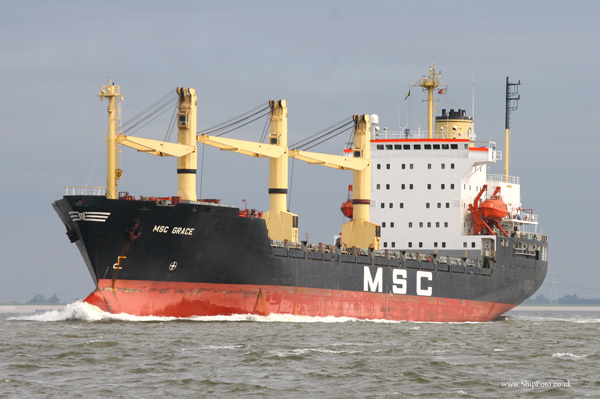 Departed on 15th August for Vigo. 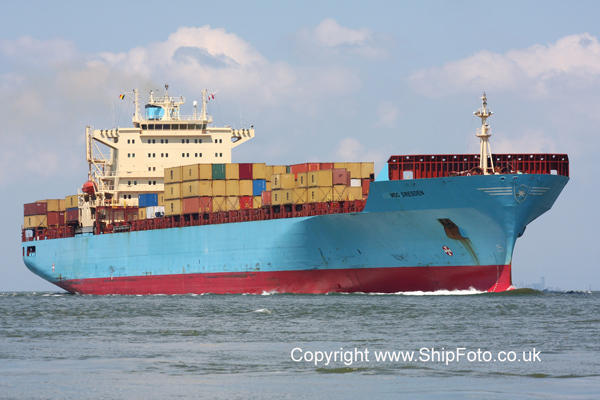 Bottom : Photographed on 16th July 2008, in the River Schelde, bound for Antwerp, arriving from Vigo. Built 2002, 9981 Grt, British flag. 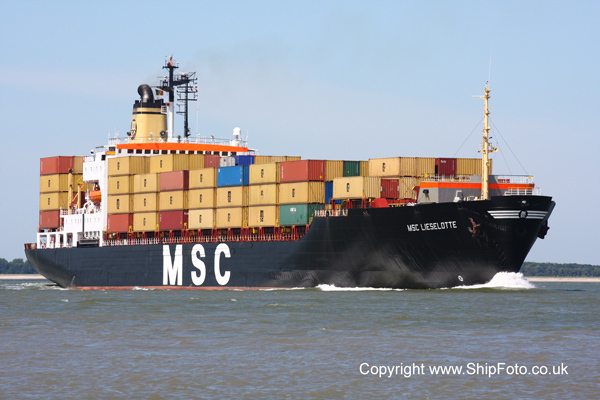 Underway in the Kiel Canal at Rendsburg, Westbound, on 16th April 2007, whilst on a voyage from Helsinki to Hamburg. Built 1992, 48508 Grt, Netherlands flag. Inward bound in Southampton Water, to berth 205, Western Docks, Southampton on 23rd December 2001. 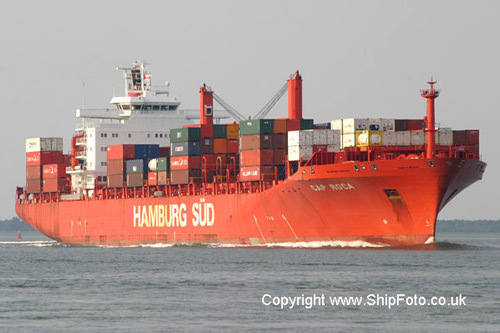 Subsequently departed Hamburg 28/12/01 for Jeddah. Inward bound in Southampton Water, for berth 204, Western Docks, Southampton, arriving from Rotterdam on 2nd April 2005. 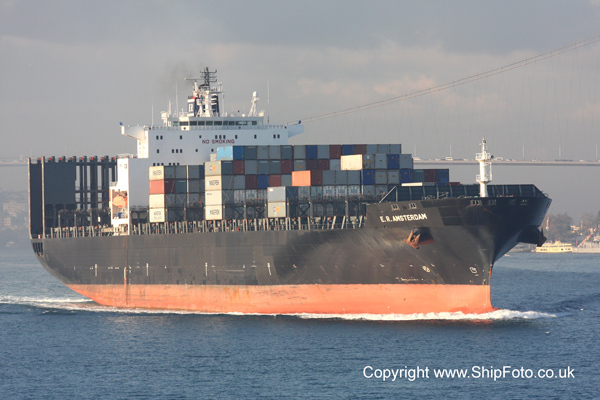 Subsequently departed for Cagliari on 3rd April. Built 1978, 43704 Grt, Bermuda flag. 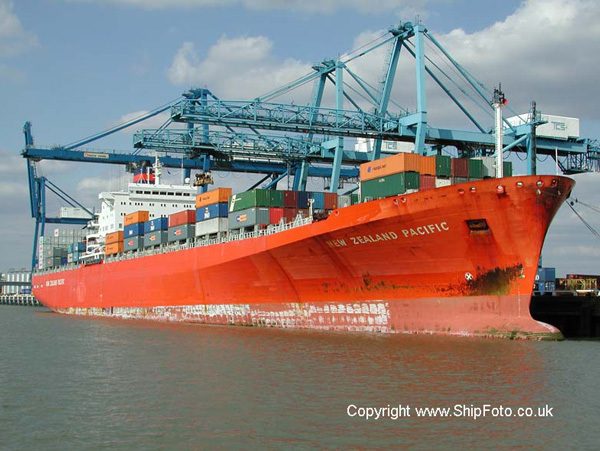 At Northfleet Hope Container Terminal, River Thames on 31st August 2002. 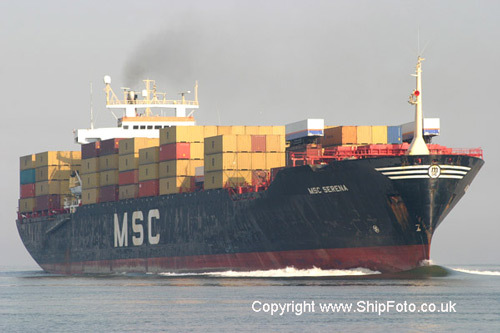 Departed on 31st August 2002 for Hamburg. 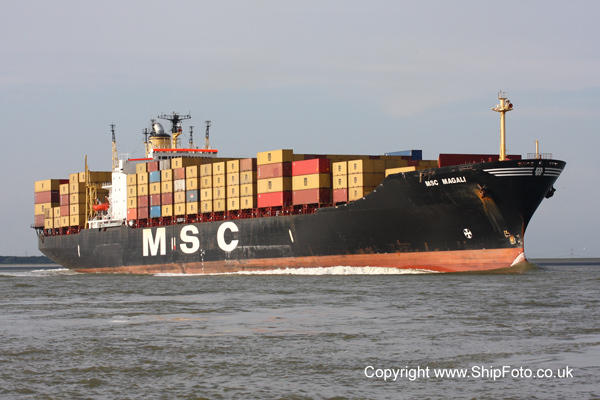 Photographed during TSS Thames & Medway Cruise. Built 2002, 26061 Grt, Bahamas flag. 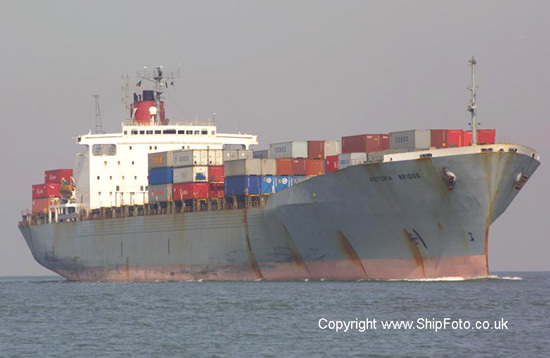 Outward bound in the River Schelde, passing Vlissingen on 20th June 2004 after departing from Antwerp. 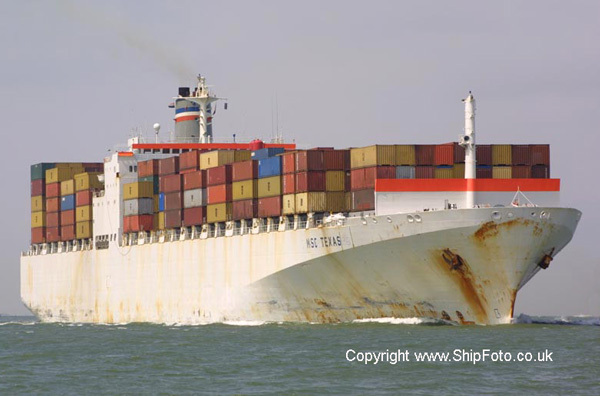 Built 1980, 32,498 Grt, Netherlands Antilles Flag. 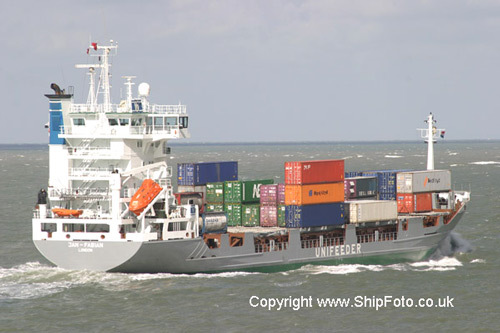 Photographed on 16th July 2008, in the River Schelde, bound for Antwerp, arriving from Amsterdam. Built 1989, 48,235 Grt, Liberian flag. 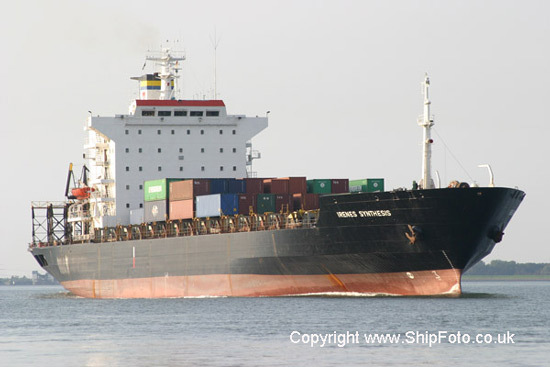 in the Bosphorus, Southbound, on 13th August 2009, whilst on a voyage from Illichivsk to Damietta. Built 1995, 4984 Grt, Antigua flag. 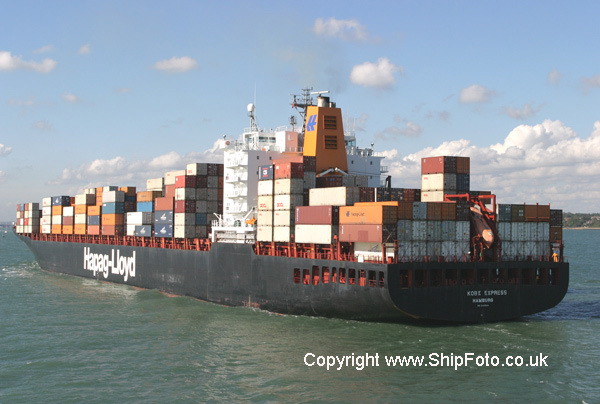 Outward bound from Southampton Harbour on 4th October 2003, bound for Belfast. Built 2002, 75484 Grt, Panama flag. Inward bound in Southampton Water for 205 berth, Western Docks, on 28th April 2007, having arrived from Singapore. 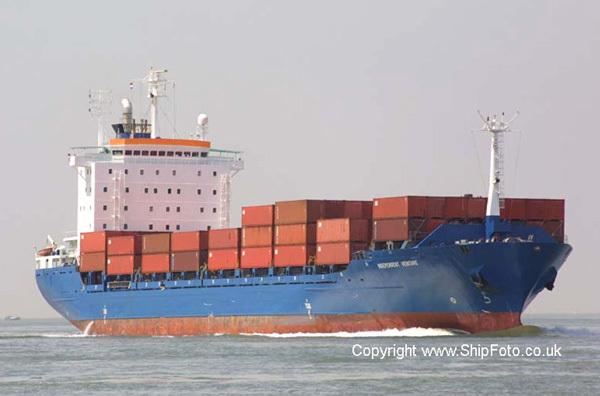 Departed on 30th April for Amsterdam. Built 1998, 76847 Grt, Panama flag. Inward bound in the River Schelde, passing Walsoorden, bound for berth 1708, Doeldok, Antwerp, on 18th July 2006, having arrived from Kobe. 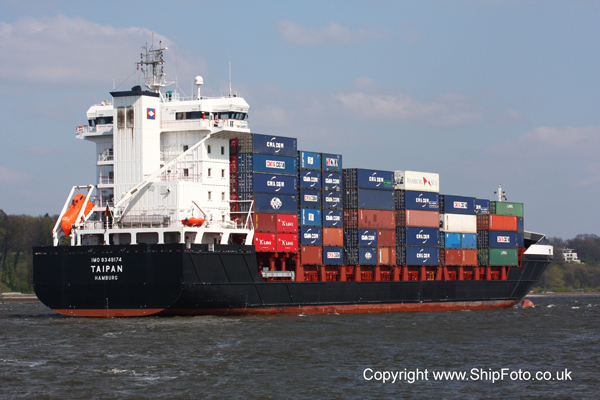 Subsequently departed on 19th July from Antwerp, bound for Yokohama. Built 2002, 75201 Grt, Panama flag. 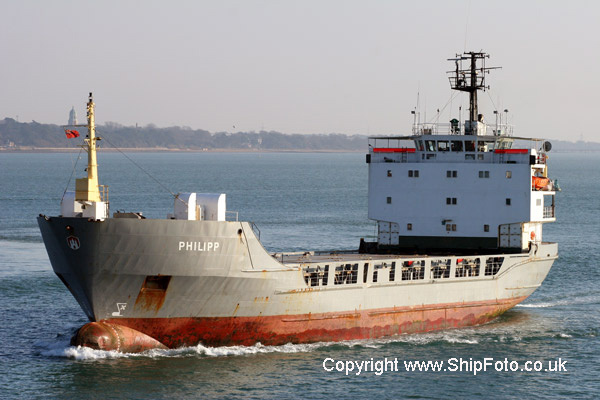 Top : Inward bound off Calshot whilst inward bound for Southampton Harbour on 23rd January 2005, arriving from Suez. 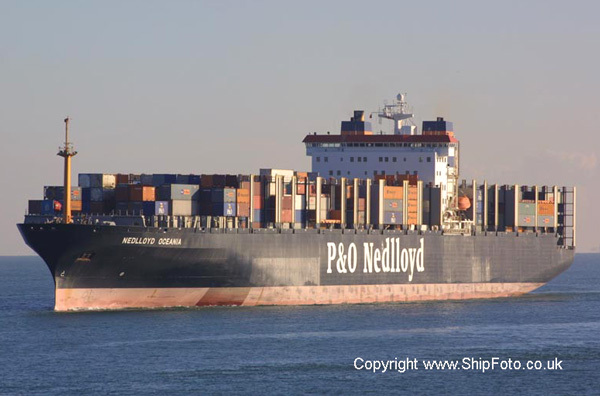 Departed from Southampton on 24th January for Rotterdam. Bottom : Inward bound in Southampton Water, bound for berth 204, Southampton on 5th May 2007. Arriving from Singapore. 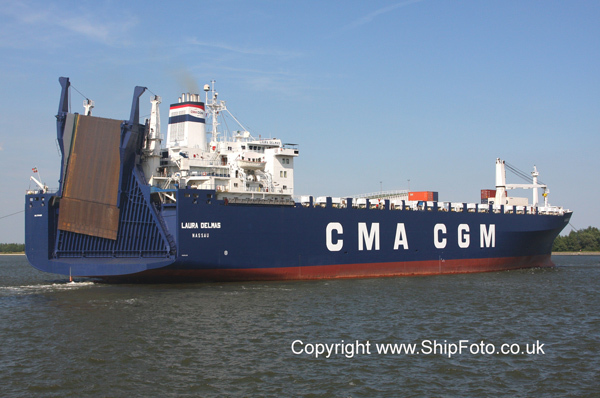 Departed on 6th May for Amsterdam. Built 1995, 2996 Grt, German flag. 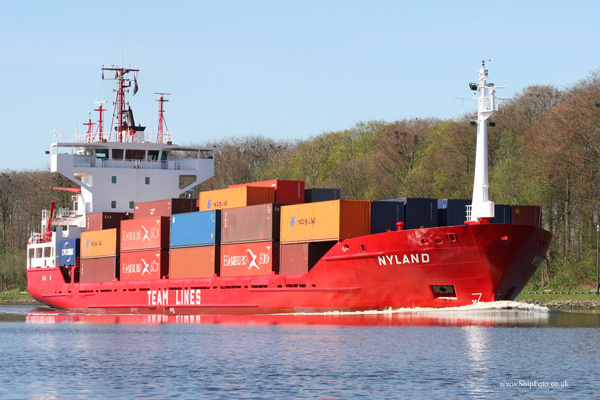 Underway in the Kiel Canal at Rendsburg, Eastbound, on 16th April 2007, whilst on a voyage from Hamburg to Gdynia. Built 2000, 20569 Grt, Maltese flag. 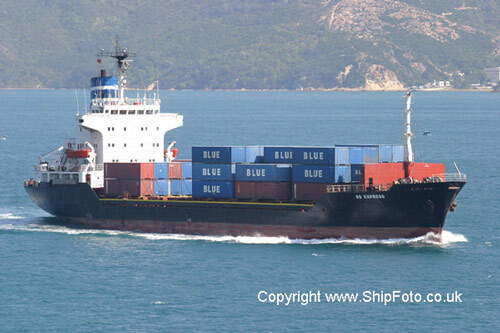 In the Bosphorus, passing Kandili, Northbound, on 14th July 2007, whilst on a voyage from Haifa to Novorossiysk, having called at Ambarli prior to passing through the Bosphorus. Built 2003, 34,202 Grt, Danish International Flag. 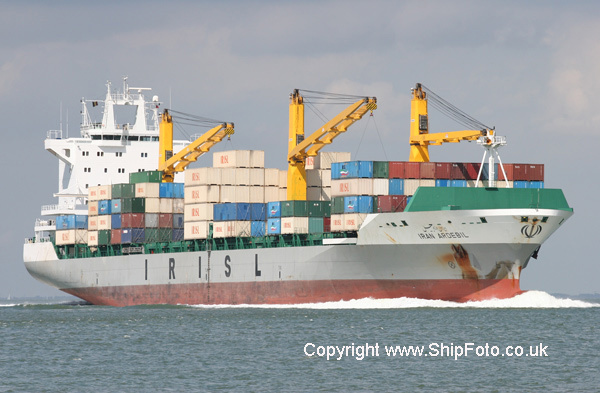 Photographed on 15th June 2008, departing from Rotterdam, bound for Tilbury. Built 1998, 39174 Grt, Hong Kong flag. Inward bound in the River Schelde on 21st June 2005, passing Terneuzen, bound for berth S.859, Antwerp. Arriving from Montreal. Built 1987, 40980 Grt, Hong Kong flag. Inward bound in the River Schelde, passing Terneuzen, bound for berth S.859/S.861, Europa Terminal, Antwerp, on 16th July 2006, having arrived from Charleston. 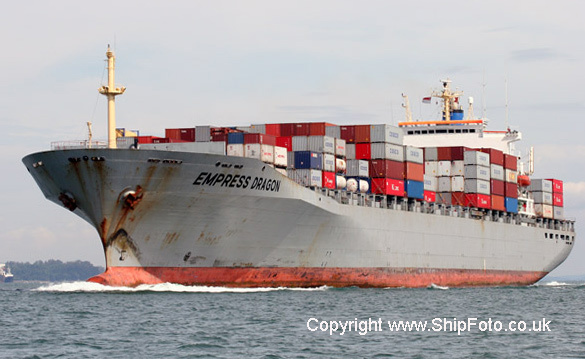 Subsequently departed on 18th July from Antwerp, bound for Thamesport. Built 1987, 40978 Grt, Hong Kong flag. Inward bound in Southampton Water from Antwerp on 4th April 2004, bound for Southampton Container Terminal. 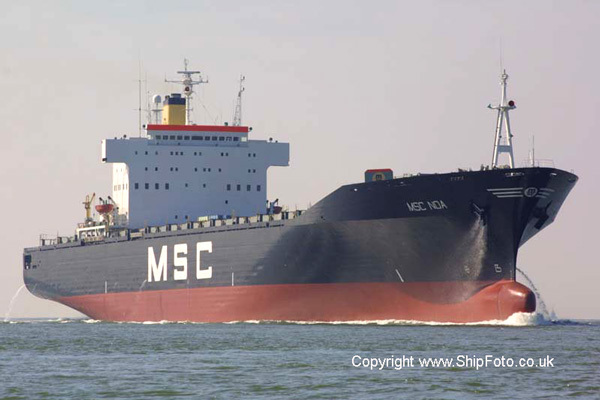 Departed on 5th April 2004 for Suez. Built 1985, 40978 Grt, Hong Kong flag. 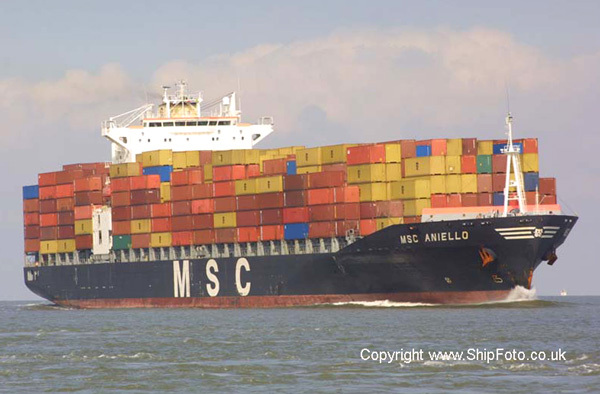 Arriving at Southampton Container Terminal from Suez on 24th Jan 2004. Built 2003, 55994 Grt, Hong Kong flag. Inward bound in the River Schelde, passing Terneuzen, on 18th August 2007, bound for berth S.911/S.913 Noordzee Terminal, Antwerp. Arriving from Southampton. 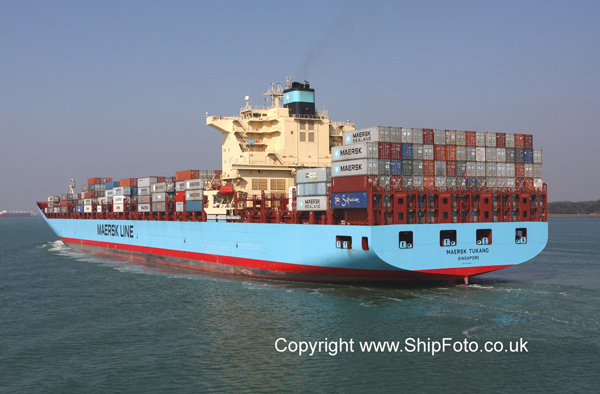 Departed on 19th August for Le Havre. Built 1992, 9151 Grt, Isle of Man flag. 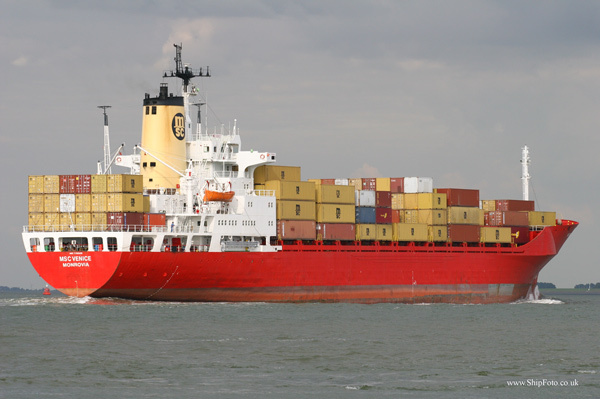 Outward bound in the Nieuwe Waterweg, after departing from Rotterdam on 9th August 2002. Built 1998, 4115 Grt, Canary Islands flag. Inward bound in the River Schelde on 21st June 2005, passing Terneuzen, bound for berth 744, Delwaidedok, Antwerp. Arriving from Cadiz. Built 2003, 7360 Grt, Canary Islands flag. 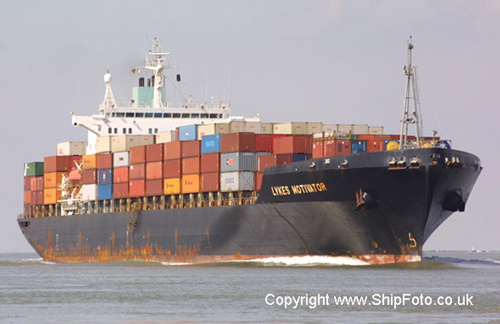 Anchored off Felixstowe on 2nd August 2003, awaiting a berth, having arrived from Cadiz. 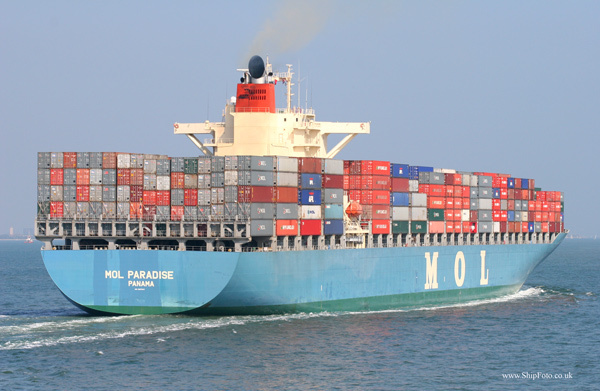 Subsequently departed for Rotterdam. Built 1999, 4115 Grt, Spanish flag. Passing Rozenburg on the Nieuwe Waterweg on 9th August 2002, bound for Rotterdam. Built 1987, 39,132 Grt, Bermuda Flag. 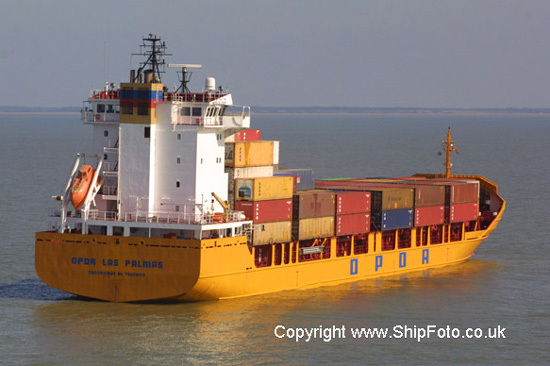 Photographed on 2nd February 2008, arriving at Southampton, from Le Havre. Built 1996, 3999 Grt, German flag. Inward bound in the River Schelde, on 4th September 2003, passing Terneuzen, bound for berth 708/710, Delwaidedok, Antwerp. 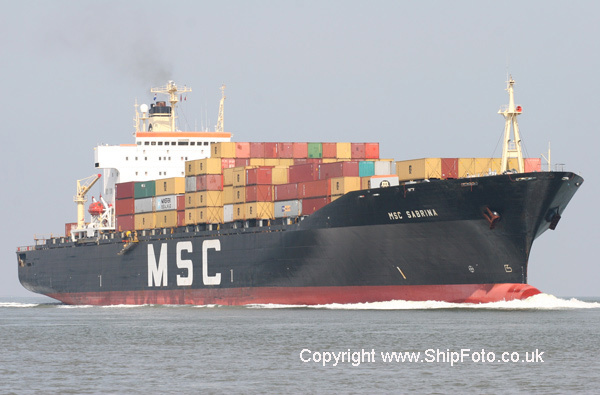 Departed on 5th September 2003 for Bremerhaven. Inward bound in the River Schelde, on 16th June 2003, passing Terneuzen, bound for Antwerp. Built 1978, 2569 Grt, Antigua flag. Inward bound in Southampton Harbour on 28th December 2005, bound for berth 204 East, Southampton Container Terminal. Subsequently departed on 28th December for Irlam. Built 1985, 27577 Grt, Liberia flag. 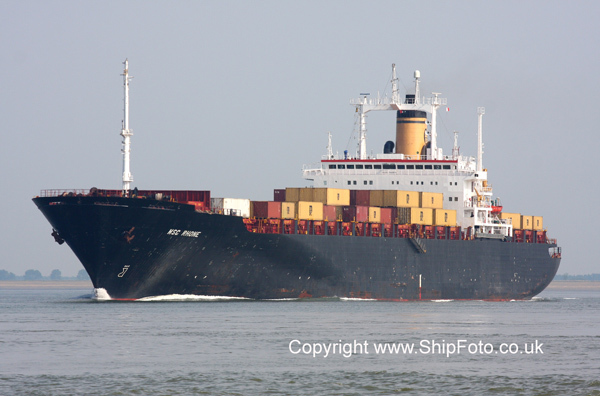 Passing Terneuzen in the River Schelde on 31st July 2001 after departing from Antwerp. Built 1975, 2791 Grt, Norweigan International flag. Inward bound in Southampton Water for berth 207 on 24th August 2003. Arriving from Rotterdam. 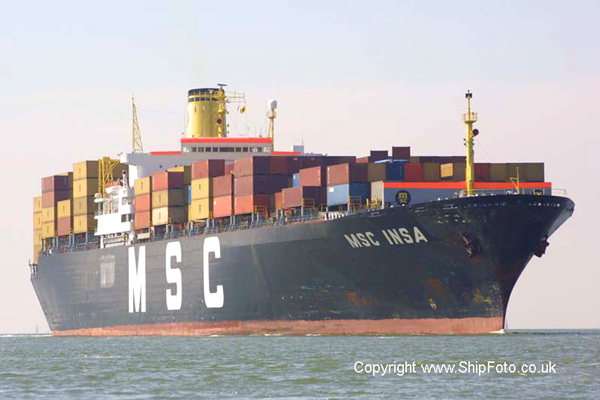 Departed for Lisbon on 24th August 2003. Built 1985, 21,887 Grt, Liberian Flag. 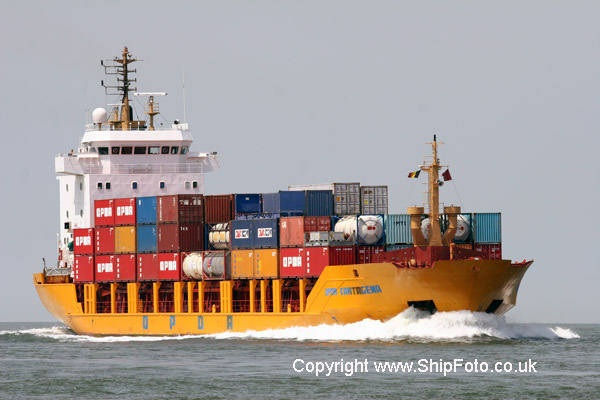 Photographed on 16th July 2008, in the River Schelde, having departed from Antwerp, bound for Le Havre. 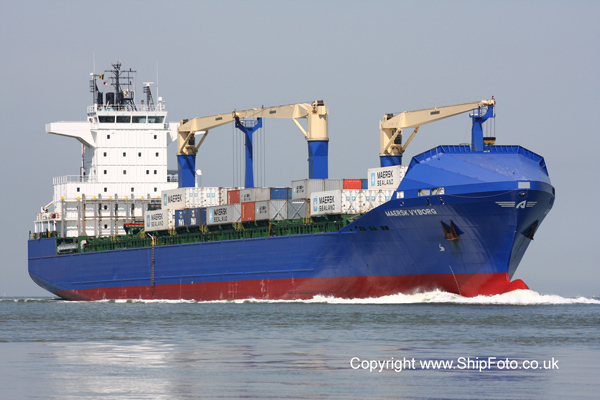 Outward bound in the Nieuwe Waterweg, passing Vlaardingen on 18th June 2005. Built 2006, 10,308 Grt, Marshall Islands Flag. 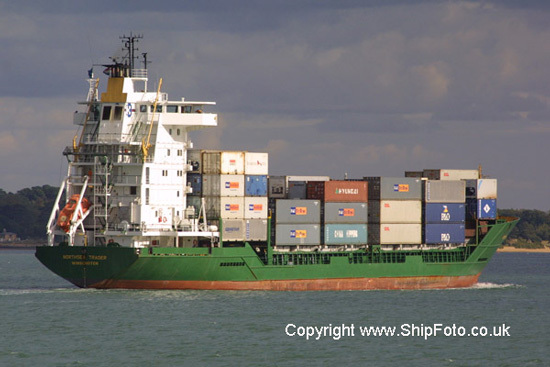 Photographed on 13th July 2008, in the River Schelde, at Terneuzen, having departed from Antwerp, for Valencia. Built 2005, 10308 Grt, Marshall Islands flag. Inward bound in the River Schelde, passing Terneuzen, bound for berth 736, Delwaidedok, Antwerp, on the 21st July 2006, having arrived from Hamburg. 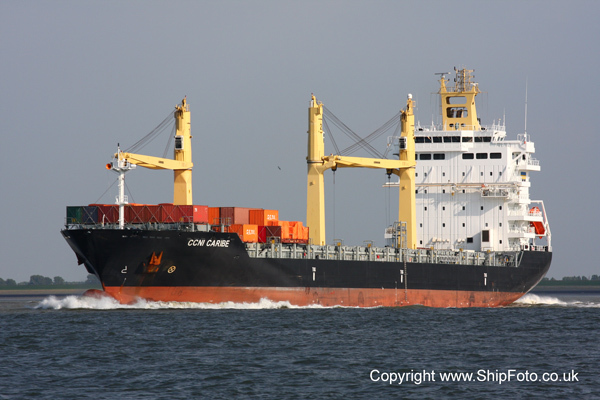 Subsequently departed on 22nd July from Antwerp, bound for Istanbul. Built 2002, 40146 Grt, American flag. Inward bound in Southampton Water, for berth 207, Western Docks, on 16th December 2006. Arriving from Antwerp. 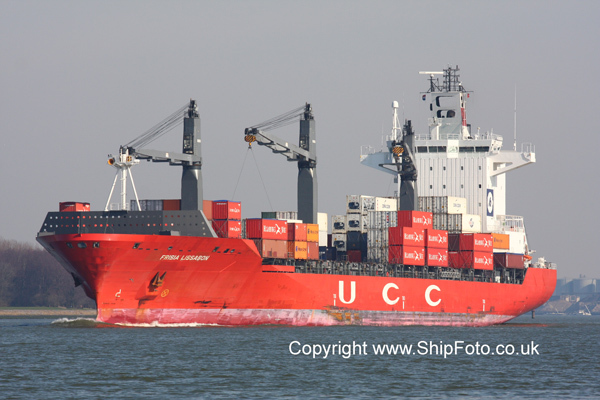 Departed on 17th December for Bremerhaven. Built 2007, 10,965 Grt, German Flag. 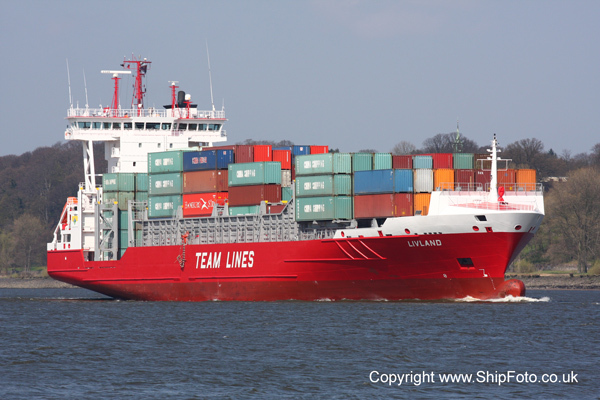 In the River Elbe, on 21st April 2008, whilst arriving at Hamburg, from Klaipeda. Built 1984, 30750 Grt, Bahamas flag. Inward bound in the River Schelde, on 2nd September 2003, passing Terneuzen, bound for Antwerp. Built 2005, 9,701 Grt, Antigua & Barbuda Flag. 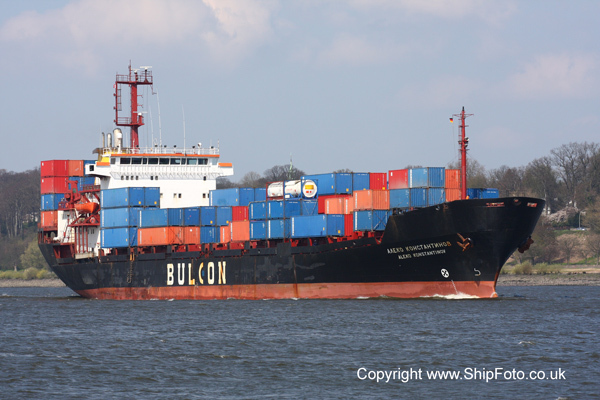 Photographed on 18th April 2008, in the River Elbe, approaching Hamburg, having arrived from St. Petersburg. Built 2004, 66452 Grt, Chinese flag. 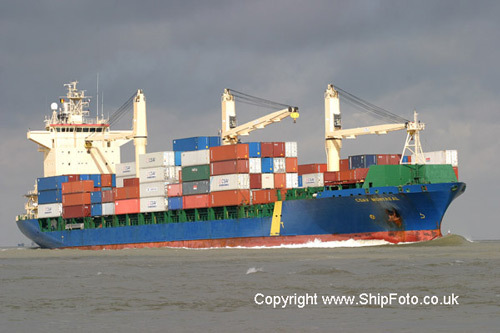 Top, middle and bottom : Inward bound in the River Schelde on 18th July 2006, passing Walsoorden, bound for berth S.907/S.909, Noordzee Terminal, Antwerp, having arrived from Hamburg. 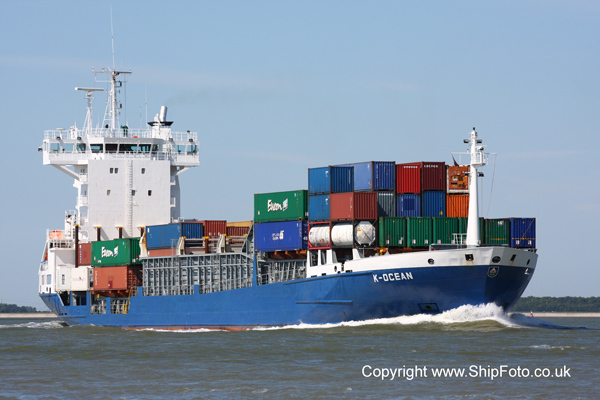 Subsequently departed on 19th July from Antwerp, bound for Felixstowe. Built 1993, 11086 Grt, Thailand flag. Arriving at Bangkok on 29th October 2005 from Singapore. 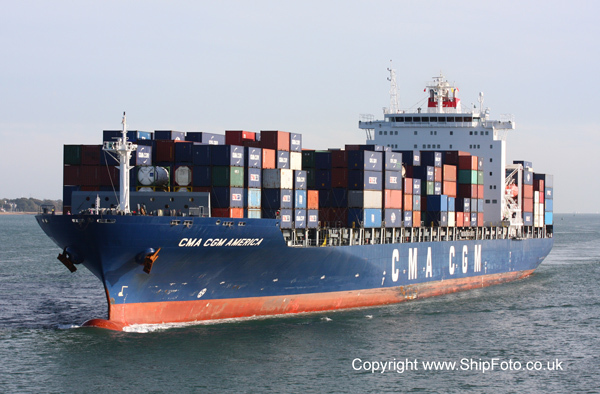 Departed Bangkok on 30th October for Laem Chabang. Photographed during TSS Far East Tour. Built 2009, 90,507 Grt, Liberian flag. 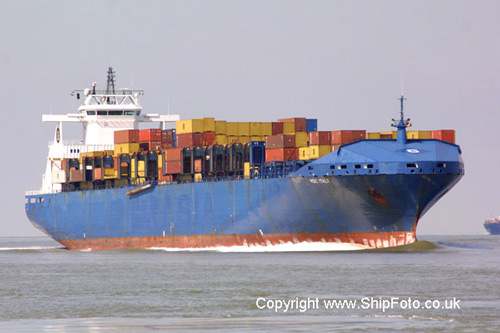 In the River Schelde on 23rd June 2009, whilst on a voyage from Hamburg to Antwerp. Built 2006, 8,971 Grt, Gibraltar Flag. 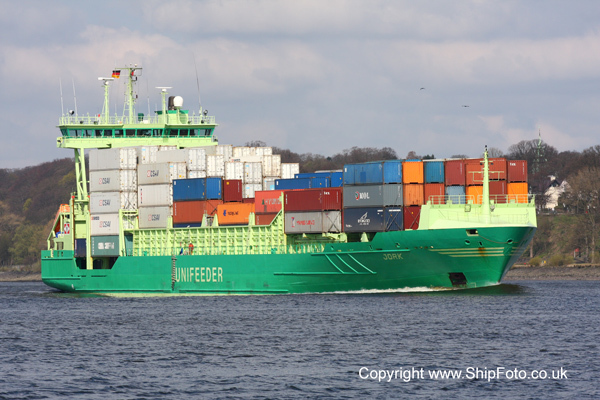 Photographed on 20th April 2008, in the River Elbe, departing from Hamburg, bound for St. Petersburg. Built 1989, 32630 Grt, Italian flag. Passing Rozenburg on the Nieuwe Waterweg after departing from Rotterdam on 6th September 2001. Built 2007, 39,912 Grt, British Flag. 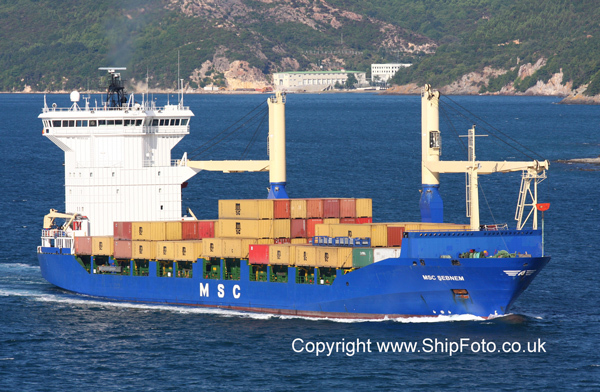 In the Bosphorus, Southbound on 7th October 2008, whilst on a voyage from Illichivsk to Shanghai.